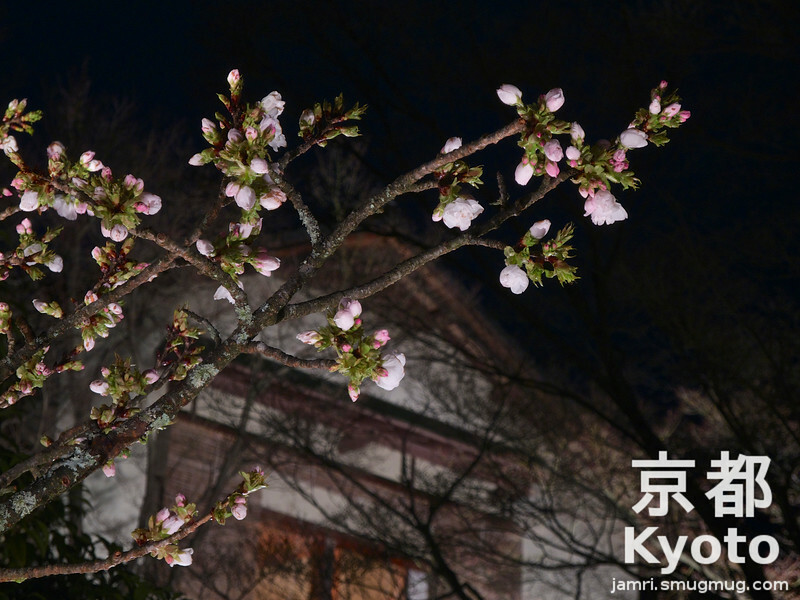 The Sakura (Cherry Blossoms) in Kyoto have begun to bloom. While most of the locations in Kyoto are still at the earlier stages, I noticed today that Hankyu Railway's Sakura charts are saying that Kiyomizu-dera (Kiyomizu Temple) is pretty good at the moment. I can't vouch personally for Sakura at Kiyomizu-dera yet, I did notice exactly one week ago that a tree near there was at about 50% bloom. With the warmer weather forecast for the next three days, many locations should start approaching full bloom before the week is over. The photo I'm sharing today is from last years (2015) Sakura blooming in Arashiyama. I feel this photo is a good complement to my "Koyo in Arashiyama" photo I took back in November 2009. "Hanami" means "flower viewing" and it is most often used in association with Sakura and having Hanami parties under the Sakura in full bloom. This photo was taken from the north bank of the Katsura river (Katsuragawa) in Arashiyama about 500m west of the Togetsukyo (Bridge). The best way to get to Arashiyama is by train. Use the JR Sagano line and alight at Saga-Arashiyama if you're coming from around the Kyoto Station area. From the downtown you can either get the subway to Nijo and then transfer on to the JR Sagano line, use the Keifu (Randen) light rail and alight at Arashiyama, or take the Hankyu Kyoto line to Katsura and transfer to the Hankyu Arashiyama line. If you're coming from anywhere in the direction of Osaka or beyond use the Hankyu Kyoto line and transfer on to the Hankyu Arashiyama line at Katsura station, alight at Arashiyama. I'm in the process of producing some promotional prints for this BLOG which today's photo is one of the photos featured on it. If everything goes well with my proof print tomorrow, I'll be handing these out at on random days and random locations around Kyoto over the next week or two. These are always done in limited batches, so they might be worth something if I become famous! 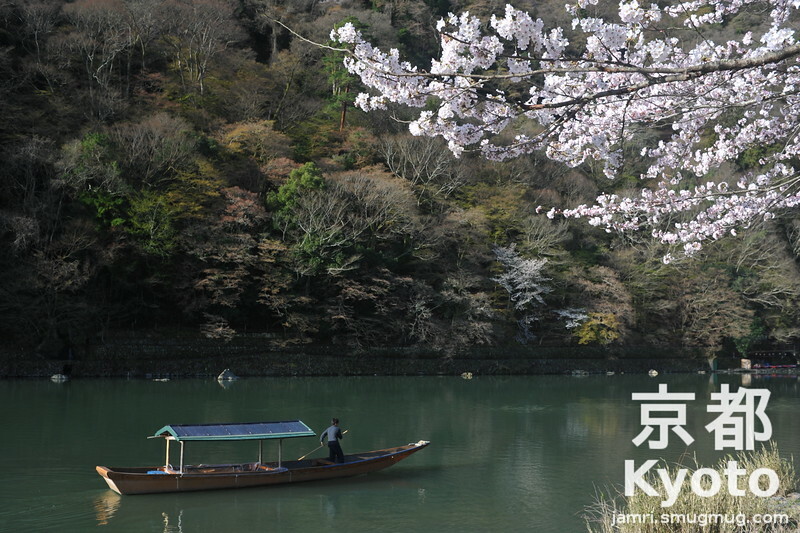 BTW "Koyo in Arashiyama" was one of the photos featured on my very first promotional print. This photo was taken with a Nikon D700 camera and an AF Nikkor 35f/2D lens with circular polarising filter. This is the JPEG straight from the camera, no post processing has been done on this photo. As I mentioned a few BLOGs ago, Hanatouro means "Flower Lantern Path" and in my opinion this would probably be one of the most beautiful sections of the Hanatouro. Seeing Yasaka pagoda framed by traditional shop houses along Hachizaka-dori is almost like stepping back in time. All year round Hachizaka-dori is a beautiful path to walk along, but it is at its absolute best during the Higashiyama Hanatouro with the lanterns and all the buildings lit up. The best way to get to this place is from Kiyomizu-dera (Kiyomizu temple). From the temple head west downhill along Kiyomizu-Zaka (Matsubara Dori). Turn right into Sannezaka which is the first lane on your right, but it's quite a way down from the temple. Head north downhill along Sannezaka, then westward along Hachizaka which is what Sannezaka becomes once you pass Ninenzaka. After you've seen Yasaka pagoda, it's worth heading a couple of blocks west to "% Arabica Cafe". The coffee there has even the most fussy coffee drinkers raving. This photo was taken with a D700 camera and an AF Nikkor 24f/2.8D lens. It was captured as a RAW (.NEF) and post processed with DxO Optics Pro and then split toned in the gimp. I made the following adjustments: Cropped to square format; Default camera corrections applied; DxO Smart lighting (slight) applied; DxO Clear View filter applied (at 25%); PRIME Noise Reduction applied; Highlights reduced; Black areas and shadows lightened; Microcontrast levels increased. The image was exported from DxO as a TIFF file and imported into Luminar where it was converted to monochrome with split toning applied. BTW the Sakura (Cherry Blossom) season is almost upon us here in Kyoto. Last year they went from a few flowers to full bloom in a day. This year they're slowly building up. With the forecast warmer weather coming, I'm sure they'll all come out in the next 5 days. I hope I can get some good shots of the Sakura this year to share with you all. Well, the Higashiyama Hanatouro is over for another year. I got to go twice this year, the only other time I did that was in 2010. I may share a shot from last night soon, but for now I want share one from the 2014 Higashiyama Hanatouro. On that Hanatouro I explored the northern end of the Hanatouro course. The northern end is a lot less built up than the southern, so it's quite a bit quieter out there. While there I spent over an hour exploring the beautiful gardens of Sho-ren-in (Sho-ren Temple). 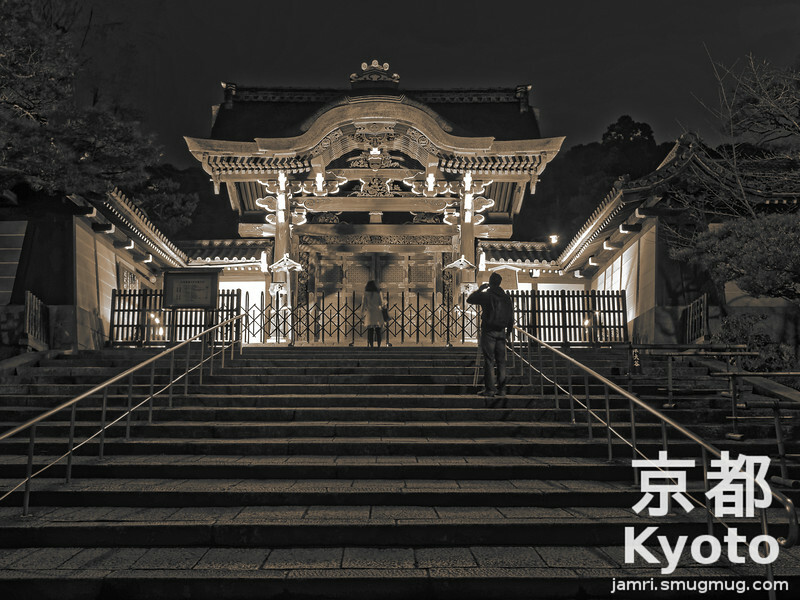 Last year I purchased DxO Optics Pro (a photo editing program) and recently I went back to my RAW files from the night visit to Sho-ren-in and got some better results than what I got in iPhoto. This was one of my favourite shots from Sho-ren-in and I think it looks even better after the processing in DxO Optics Pro. Sho-ren-in is a Buddhist temple in northern Higashiyama, Kyoto. The nearest train station is Higashiyama on the Kyoto Municipal Subway, Tozai Line. The garden is very expansive, you could easily spend a couple of hours there. If you visit Sho-ren-in and nearby Chionin (Chion temple) at a leisurely pace, it could take you half a day! Both have very large grounds with lots to see and photograph. This photo was taken with a Nikon Coolpix P7100 camera on a tripod. If you check the picture info you'll find it was an 8 second exposure, I'm amazed how the lady with the camera in her hand stayed still for that long! This photo was captured as a RAW (.NRW format) and post processed in DxO Optics Pro. I made the following adjustments: Default camera corrections applied; DxO Smart lighting (slight) applied; DxO ClearView filter applied at default; PRIME Noise Reduction applied; Highlights reduced; and Microcontrast levels increased. Here's another shot from this years Higashiyama, Hanatouro. 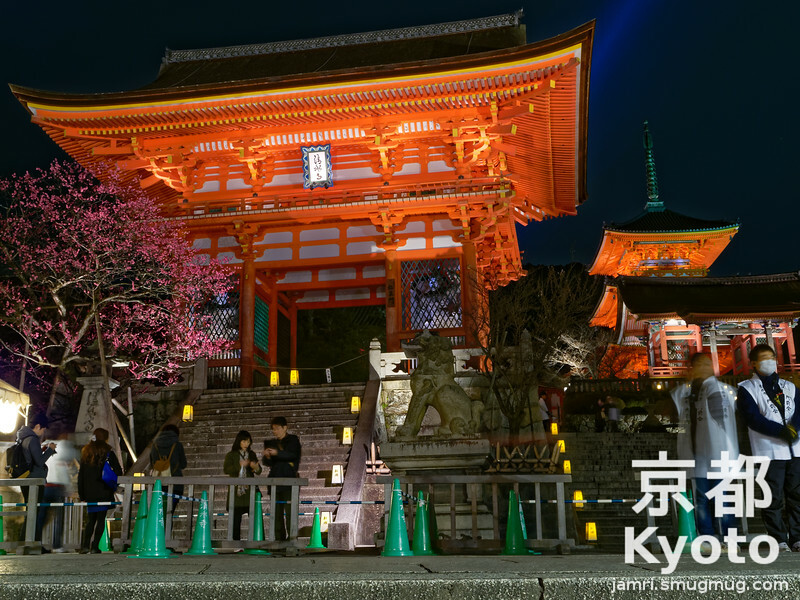 Kiyomizu-dera is probably the most famous Buddhist temple in Kyoto. It was a finalist (but didn't make the final 7) in the New7Wonders of the World. I didn't go inside this time, as I have been in at night before and they don't allow you to use tripods in there. When I shot the main hall of Kiyomizu-dera at night with a Nikon D700 and a 35f/2 lens, my exposure settings were "1/13s f/2 iso6400", so there's not much light on the main hall. Some other parts like the gates and the pagoda are more brightly lit up. The two men standing at the right side of the picture wearing white "happi coats" are volunteers helping with crowd control. There are a lot of volunteers who help out with various things on Hantouro, although in Japan often volunteers don't volunteer themselves, but rather are volunteered by the community groups and neighbourhood associations they belong to. Since Kyoto is the cultural centre of Japan, many Japanese people who move to Kyoto from other parts of Japan, really don't like having to volunteer in the many cultural festivals here. Kyoto is a very hard place to settle in for non-local Japanese people, because of these obligations. However, foreign residents are pretty much ignored by these groups. So, please spare a thought for the "volunteers" whenever you attend a festival in Kyoto! This years Higashiyama Hanatouro still has three nights to go (last night March 21st). The lights come on at 6:00pm and are switched off at 9:30pm. The best train stations to access the Higashiyama Hanatouro are: On the Keihan Railway's Main Line, Gion-Shijo and Kiyomizu-Gojo; On the Hankyu Railway's Kyoto Line, Kawaramachi; On the Kyoto Subway's Tozai Line, Higashiyama. This photo was taken with a Nikon Coolpix P7100 camera on a tripod. It was captured as a RAW (.NRW) file and post processed in DxO Optics Pro. I made the following adjustments: Default camera corrections applied; DxO Smart lighting (slight) applied; DxO ClearView filter applied at default; PRIME Noise Reduction applied; Highlights reduced; Black areas lightened; Contrast and Microcontrast levels increased; and Vibrancy increased. As I promised in the last BLOG, here's a photo from this years Higashiyama Hanatouro (on every night in Higashiyama, Kyoto from 6:00-9:30pm until March 21st). For those unfamiliar with "Hanatouro" it comes from three characters in Japanese meaning flower, lantern and path. A Hanatouro is a special event where a certain area is lit up with flower lanterns and other lighting. Currently there are two annual Hanatouros in Kyoto. One in Higashiyama (runs for 10 nights in March) and one in Arashiyama (runs for 10 nights in December). As well as the flower lanterns lining the road ways in the area, a number traditional buildings are lit up and some even have special night openings. In addition there are ikebana displays, various cultural performances, traditional costume parades, temporary food stalls in certain parks and many shops stay open til late. The two towers in the photo are a Yasaka Pagoda and the Kyoto Tower. Yasaka Pagoda is considered to be the symbol of the Higashiyama area, so what better photo to show as my first for this year's Higashiyama Hanatouro. For those of you who have being looking at my photos on some of my other galleries or sites, might be thinking you've seen this photo before. Well, actually this the fourth time I've photographed the Yasaka Pagoda and Kyoto Tower from this spot during Hanatouro. However on the other three occasions it was later in the evening. Taking it earlier means getting blue in the sky and the Kyoto Tower is not as bright in comparison to the background. This photo was taken with a Nikon Coolpix P7100 camera on a tripod. It was captured as a RAW (.NRW) file and post processed in DxO Optics Pro. I made the following adjustments: Default camera corrections applied; DxO Smart lighting (slight) applied; PRIME Noise Reduction applied; Highlights reduced; Black areas lightened; and Microcontrast levels increased. It was also cropped down from a 4:3 ratio to a 5:4 ratio. While I was taking some photos at the western side of Kyoto station, I noticed that there is another good spot to view the Kyoto Tower. 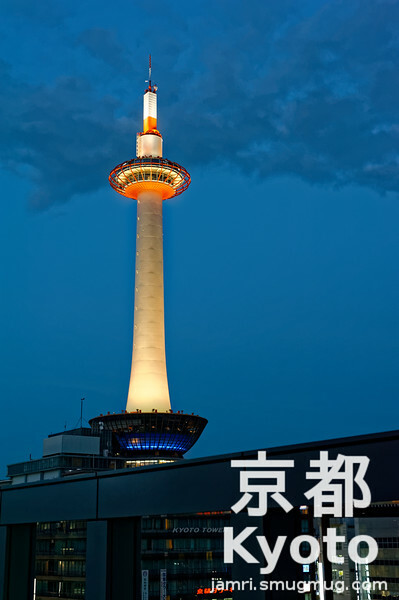 My previous BLOG photo of the Kyoto Tower was taken from the eastern side. Actually, there are many points of view you can get of the tower from around the station and beyond. So maybe when you're in Kyoto you might want to try for some unique shots of the Kyoto Tower. Access to the Kyoto Tower is easy, it's just north of the Kyoto train station. Japan Rail (JR), Kintetsu Railway, the Shinkansen, and the Kyoto Municipal Subway all have stops in or under the station complex. The Kyoto Tower provides a very good view of the city. You might even see some sights from the tower that you decide to explore more closely later. My favourite time to visit the tower is at sunset and then staying there for about an hour after it. With Higashiyama Hanatouro happening at the moment, it certainly is a good time to be visiting Kyoto. How time has flown, and I haven't posted many BLOGs since December's Arashiyama Hanatouro. I went to the Higashiyama Hanatouro last night, so I'm planning to post another BLOG later today or tomorrow with a photo from that. Happy Travels. This photo was taken with a Nikon D700 camera and an AF Nikkor 50f/1.8D lens. It was captured as RAW (.NEF) file and post processed in DxO Optics Pro. I made the following adjustments: Default camera and lens corrections applied; DxO Smart lighting (slight) applied; DxO Clear View applied at default setting; PRIME Noise Reduction applied; Highlights reduced; Contrast and Microcontrast levels increased; and Vibrancy Increased. We've had a much warmer than usual winter here in Kyoto. As a consequence the Plum (Ume) Blossoms have already started. It's about 2 weeks earlier than usual. Actually in some places in Japan the plums have bloomed 3 weeks early. Now I'm not sure how this is going to affect the Cherry (Sakura) Blossoms this year, because they are trigged by higher temperatures than the plums. However I will let you know when the cherries start showing signs of blooming. Earlier in the week I stopped in a Kitano Tenmangu Shrine (one of Kyoto's best plum blossom sites) for about an hour and a bit to get some photos of the flowers. I have it on some good authority that the gardens of Zuishin-in temple near the Ono subway station (Kyoto Municipal Subway Tozai line) are another good plum blossom viewing spot. I'll have to check that out before the plum blossom season is over. Kitano Tenmangu Shrine is located near the corner of Imadegawa Dori and Nakadachiuri Dori, not far from Nishioji Dori. There is a light rail train station named Kitano-Hakubai-cho about 5 minutes walk away, but unless your coming from Arashiyama, it's probably better to use a bus. The most convenient bus is number 203, from Nishioji Dori just outside Saiin Station on the Hankyu Railways Kyoto line, or from Imadegawa Dori near Demachiyanagi Station on the Keihan Railway's Main Line. There are other buses on Nishioji Dori that you can catch near Saiin Station (if you miss a 203) which continue Northward on Nishioji Dori without turning into Imadegawa Dori, if you use one of these you get off near Kitano-Hakubai-cho Station (a recorded announcement in English is played just before it stops there). Another attraction nearby Kitano Tenmangu Shrine is a Geisha district called Kamishichiken which is just to the east of the Shrine. 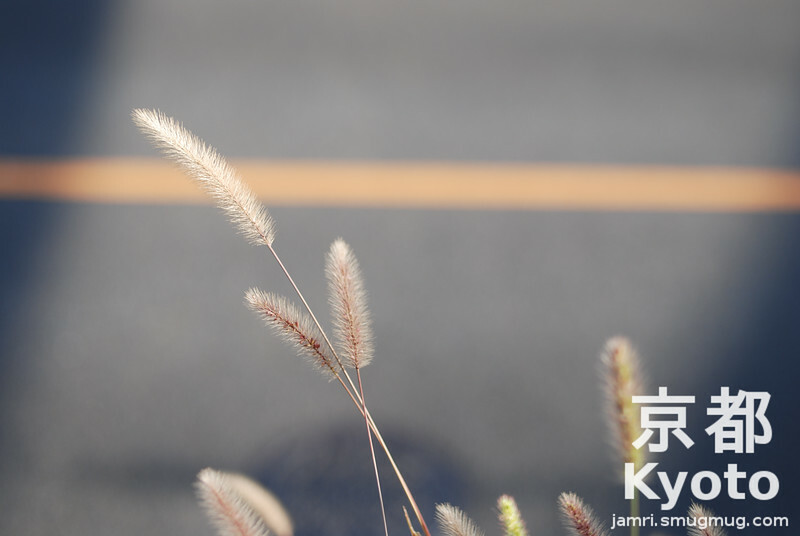 This photo was taken with a Nikon D700 camera and an AF 85/f1.8D lens. It was captured in RAW (.NEF format) and converted to JPEG in DxO Optics Pro. I made the following adjustment to the image: Default camera and lens corrections applied; The image was cropped; Highlights reduced; DxO Smart Lighting applied at default level; DxO ClearView applied at default level; Vibrancy increased; and PRIME noise reduction applied. One of the early entries to this BLOG was titled "The Station that's a Destination". 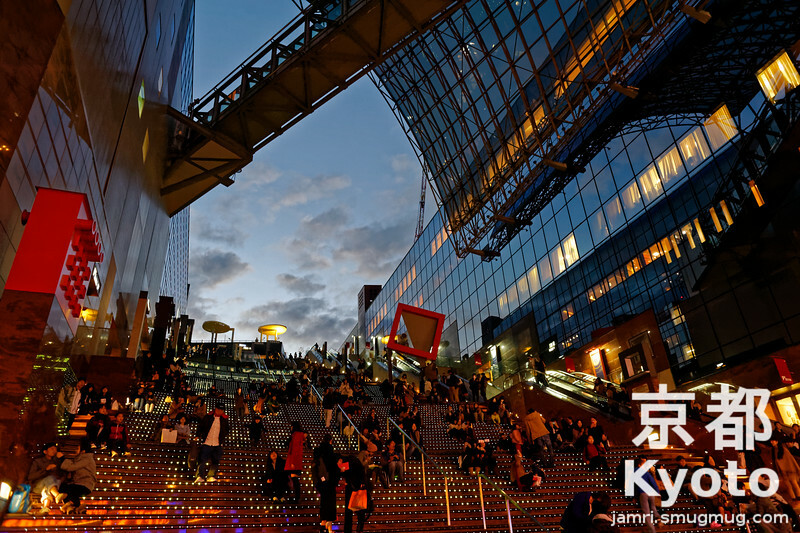 In that BLOG I talked about the various attractions at Kyoto Station. On the Western side of the station there is vast stairway which doubles as seating. From there you can watch events on the stage below at certain times of the year, sit for a meal or just take in the view of the amazing station architecture. Along the steps their are led lights which can change colour and display things. During the festive season these stairs are good location to get photos of the station's huge Christmas tree. On this occasion I was at the station taking photos and an event was going be held later in that evening. There were welcome messages in various languages on the steps. You might be able to make out the German one at the top. Kyoto Station is two subway stops south of the downtown area on the Kyoto Municipal Subway's Karasuma line. Kyoto station is the main terminal for JR trains in Kyoto Prefecture and the Shinkansen (Super Express, aka "Bullet Train"). There's also a large station for the Kintentsu railway in the same building, which is convenient to get to Kyoto's southern suburbs, Nara prefecture and Mie prefecture. This photo was taken with a Nikon D700 camera and an AF Nikkor 24f/2.8D lens. It was captured in RAW (.NEF format) and converted to JPEG in DxO Optics Pro. I made the following adjustment to the image: Default camera and lens corrections applied; Slight DxO Smart Lighting applied; DxO ClearView applied at default setting; Contrast and Microcontrast increased; Vibrancy increased; Highlights reduced slightly; and PRIME noise reduction applied at default setting. 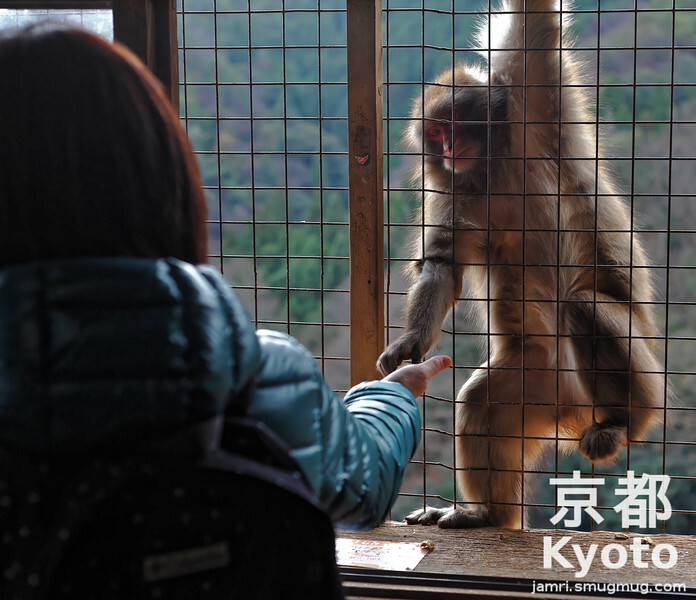 On the slopes of Mount Arashi (Arashiyama) in Kyoto (with a panoramic view of the city) there is a monkey park with a difference. The humans are in the cage and the monkeys roam free! Well, actually you can roam free too, but you have to get in the cage if you want to feed the monkeys. Earlier in this year we had some friends visiting from Australia and we brought them to this wonderful monkey park, which is not far from the Hankyu Arashiyama Station. My friends were impressed how well behaved the monkeys were, they'd had been to some other monkey parks in other countries where the monkeys weren't so well behaved! Getting up to the feeding room is a bit of an uphill hike from the park entrance. It would probably be pretty hard going on a hot day. We saw a couple of monkeys near the entrance, but didn't see anymore until we were at the feeding room. Make sure you are careful to observe all the instructions for your own safety. Yesterday was Chinese New Year, so I'd like to wish you "Gong xi fa choi". This Chinese year is the year of the monkey. It's also the year of the monkey here in Japan, but here it began on January 1st. This is my 1st BLOG post since Christmas, I had a doubly busy January schedule of work this year. Plus my new year break was busier than usual with a number of visitors from Australia, and also catching up with friends and relatives here. Hopefully from now I can start posting two or three BLOGs a week, plus my usual photo stream shots. This photo was captured with a Nikon D700 Camera and an AF Nikkor 50mm/f1.8D lens. I made the following adjustments in DxO Optics Pro: Cropped off some of the right side of the picture; Default camera corrections; DxO Smart Light filter applied; Reduction of highlights sightly; DxO Clear view filter applied at default setting. 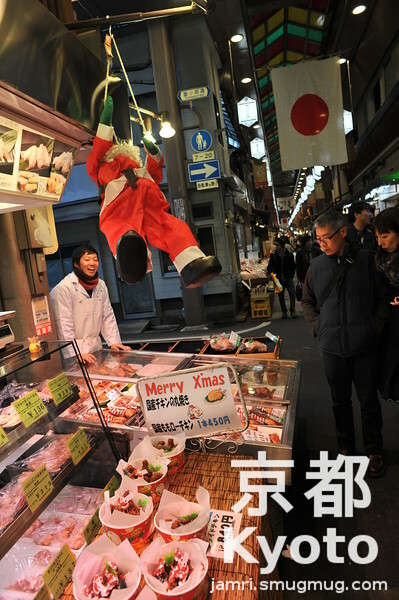 Japan has some unusual Christmas customs. Firstly, Christmas day is not a public holiday in Japan. This is because there are no public holidays for any religions here. All public holidays are secular, at least based on their names, although some of them are cleverly disguised Buddhist or Shinto holidays. All of this doesn't stop the shops here playing very Christian Christmas Carols (that many shops probably wouldn't in the West these days out of fear of offending non-Christian customers), but only in English. I wonder what would happen if they started playing Christian Christmas Carols in Japanese? Would people complain, since Japan is only 1% Christian? There are some other unusual customs for Christmas. It seems more like a valentines day, especially Christmas eve is considered a time for a romantic meal with your significant other. Then there's the fact that all of the Christmas decorations disappear and Christmas songs stop on Christmas day to make way for the New Years decorations and New Years music (traditional Japanese style). Also people don't eat turkey for Christmas here, they eat chicken. The custom of eating chicken for Christmas in Japan began with believe it or not: KFC! People here thought that good olde Colonel Sanders looked like Santa-san (as he's called in Japan) and KFC started a big marketing campaign for Christmas. Slowly each of the other fast food chains here started making their own Christmas Chickens and also traditional Japanese Chicken shops. So here it doesn't matter if you eat fried, bbq, roast, or teriyaki for Christmas as long as it's chicken. The chicken shop in this photo is a traditional Japanese one located in the Nishiki markets in Kyoto. No matter what time of the year you come to Kyoto, make sure you include the Nishiki markets on your itinerary for an authentic Kyoto experience. If none of the traditional foods there take your fancy, there are four very unique ice cream shops in the markets that you should try if you like ice cream. Nishiki markets are located one block north of Shijo Dori on Nishiki Dori, between Karasuma Dori and Teramachi Dori. The nearest stations are Hankyu's Karasuma Station and the Kyoto Subway's Shijo-Karasuma Station. This photo was captured with a Nikon D700 camera and an AF Nikkor 24/f2.8D lens. This is the original jpeg from the camera, no post processing has been performed on this image. Well, technically "Photos with a Maiko-san (apprentice Geisha)", based on the kind of makeup and kimono she is wearing. The two Hanatouro's (Arashiyama and Higashiyama) are occasions when the general public get to see real Geisha for more than a brief moment. During Hanatouro there are dance performances put on by the local Geisha houses for the public. I'm not sure if it's still the case, because I didn't see one there this year, but back in 2010 (when this photo was taken) and later, it was possible to have your photo taken with a Maiko-san. I don't think it cost anything either. You just lined up (the line was huge, so I didn't bother) and gave the guy your camera and he took a photo of you (or your group) with the Maiko-san. I also saw the same thing happening at an Higashiyama Hanatouro back in 2013, but not in the past two years. As I said I'm not sure if these photos with a Maiko-san are still offered at Hanatouro. However there is one occasion where for a small fee you can get served tea by a Geisha and take some photos. 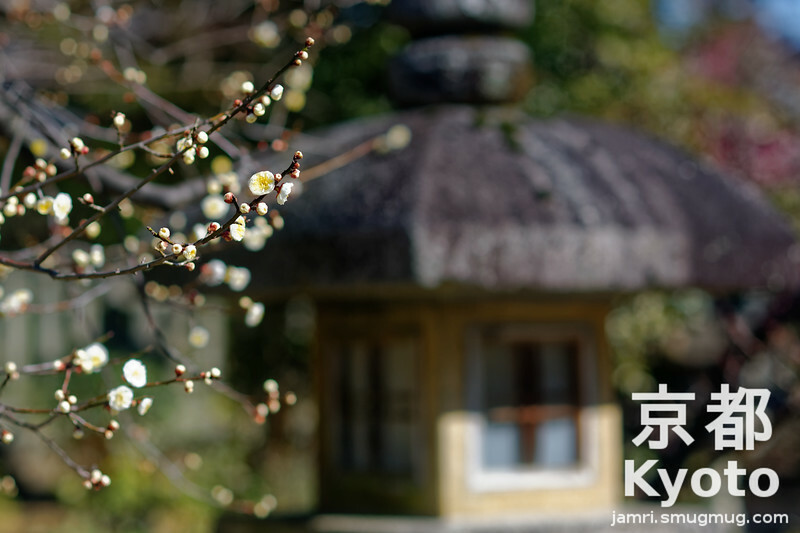 That occasion is the 25th of February at Kitano Tenmangu Shrine, when the Geisha from a nearby Geisha house go there to celebrate the plum (ume) blossoming. This photo was taken on Fujicolor PRO400 film (my favourite film for night photos, on the rare occasions when shoot film these days) using a Nikon F80 Camera and an AF Nikkor 50f/1.8D lens. The negative was scanned by the DPE (Develop Print Enlarge) shop. From the scan they gave me I adjusted the contrast slightly higher in iPhoto. Here's another photo from my 2nd visit to the Arashiyama Hanatouro this year. This location a Soba Restaurant called "Yoshimura" was one I passed on my first visit. However, that time it was later in the evening when there was no blue left in the sky. I decided to go to this location earlier on the 2nd visit to get a shot while there was still blue left. You'll notice there are still some leaves remaining on the Japanese Maple tree. Our weather this year is about three weeks behind schedule compared to average, it's unusual for there to be so many autumn leaves remaining when we get to Arashiyama Hanatouro time. Soba are buckwheat noddles served in either hot or cold. Hot soba is usually served in a broth. Cold soba is usually served on ice with a cold sauce to dip them in before eating. A special kind of soba for Kyoto is Nishin Soba, which contains herrings marinated in a sweet sauce added to the hot broth just before serving. This is probably my favourite kind of soba. It's funny because before we moved to Kyoto my wife never had tried Nishin Soba, since fish is not added to soba where she's from (Kagoshima), but she also likes it now. Good soba restaurants make the soba and broth freshly on location, but are usually still not too expensive (under 1500yen ($15)) unless the meal includes lots of other items. Bad soba restaurants use packet soba and broth, but these places should be really cheep. I can buy the soba noodles, a packet of broth and the marinated herrings in the supermarket here for a total of about 150yen ($1.50) per serving. Soba along with Udon (fat noodles made from rice) are my two favourite Japanese comfort foods (i.e. food I can eat even if I'm sick and lost my appetite for most other things). Yoshimura Soba is in Arashiyama on the North Bank of the Katsura river just to the west of the Togetsukyo (Moon Crossing Bridge). Here is a link to the menu (in Japanese with some photos). Given the restaurant has a good view of the Katsura river and the Togetsukyo, the meals are excellent value. This photo was taken with a Nikon COOLPIX P7100 camera mounted on a tripod. It was shot as a RAW (.NRW) file and post processed with DxO Optics Pro. I made the following adjustments: DxO Smart Lighting filter applied; DxO ClearView filter applied; Highlights reduced; Increases to the contrast and mircocontrast levels; Vibrancy increased; and PRIME noise reduction applied. This year I was able to go twice to the Arashiyama Hanatouro, even though it is a fairly busy time of the year and I work most evenings (which is par for the course when a lot of your work is doing after school English classes for children). It's always good to go back a second time to these kind of events. I find I can have a second go at some subjects I didn't quite get the shots of I wanted because of the camera/lens combo I chose on the first visit. I got quite a few keepers of shots I missed on the first visit for the year, which I plan on posting later. However, this shot was not one I planned based on misses from the first visit for the year. This was one I just happened to see on my second visit and it is shot from the opposite bank of the river to where I normally shoot this bridge from during the Arashiyama Hanatouro. What makes this work for me is the fact that the mountains you can see from this side a not lit up (which adds more contrast) and that you get see more water (so it makes more sense why this bridge is needed). 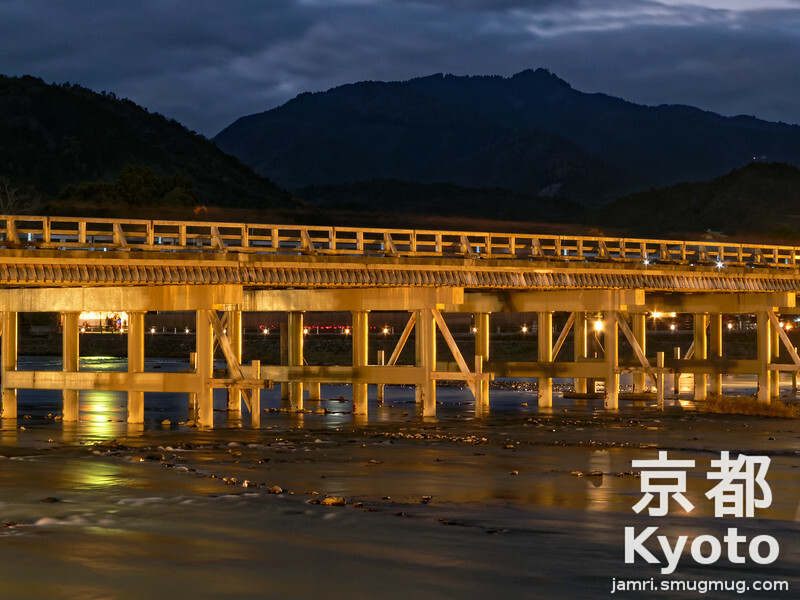 The Togetsukyo (meaning "Moon Crossing Bridge) is a famous bridge in the Arashiyama area of Kyoto city. The Arashiyama area is a pretty well preserved traditional area near the mountains in Kyoto. While there are some modern buildings there, but no big chains like McDonald's or Starbucks are allowed there. The further you get away from the train stations (especially the North Western part) the more traditional and rural it gets. There are a number of famous Buddhist temples, Shinto Shrines, a Samurai actor's mountain villa, and many shops selling traditional food and handicrafts to explore. 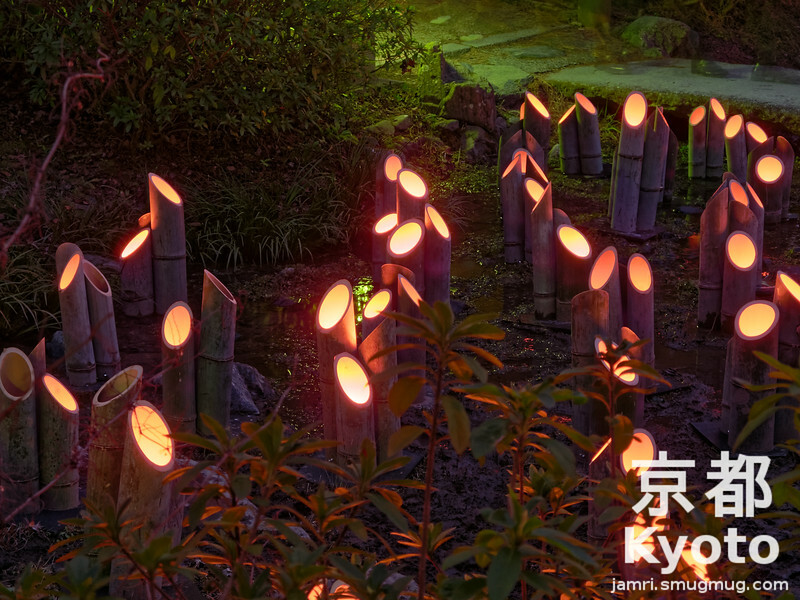 The Arashiyama Hanatouro is a 10 night light up event held every December in the middle of the month. It normally starts on a Friday night and finishes on the Sunday night 10 nights later (this year was from 11th to the 20th). 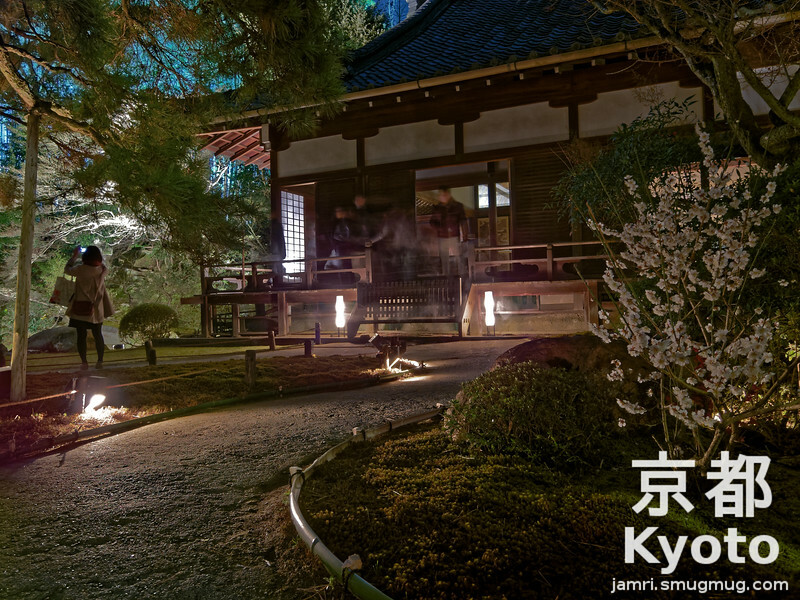 Many of the attractions in Arashiyama are lit up with different kinds of lighting for the event. It has been running for about 10 years now and it seems to get bigger each year. If you don't have to work week nights (or you're here as a tourist), then I recommend going on a week night than a weekend night as it's much less crowded. This photo was taken with a Nikon COOLPIX P7100 camera mounted on a tripod. It was shot as a RAW (.NRW) file and post processed with DxO Optics Pro. I made the following adjustments: DxO Smart Lighting filter applied; DxO ClearView filter applied; Sight increases to the contrast and mircocontrast levels; Vibrancy increased; and PRIME noise reduction applied. Today's photo is another one I took on Saturday during my visit to this year's Arashiyama Hanatouro. As you might notice in this photo there is still a bit of autumn colour remaining, which is rare for this time of the year. Actually, early December's weather here this year was more like early November weather. The Arashiyama Hanatouro is on every night from 5:00pm-8:30pm until Sunday night (December 20th). 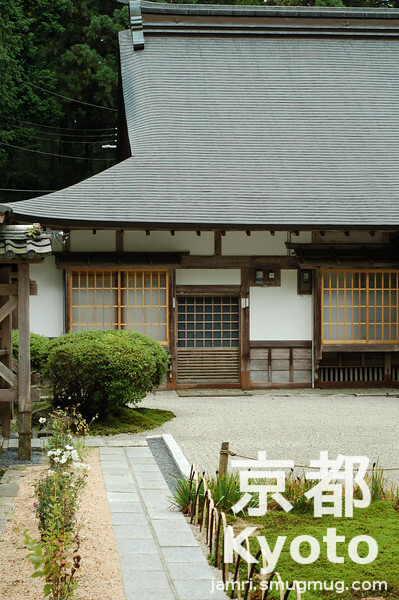 Okochi-sanso is the former villa and gardens of a silent samurai film actor named Denjiro Okochi. By day it is a very beautiful place to wander around and enjoy the gardens. By night there was less to see, but it was still worth it for me to get shots of the buildings and parts of the garden lit up. However most of the 2 hectares of gardens were pretty dark with only small lanterns to mark out the path. Since I only brought the 24mm lens with me, it wasn't worth trying to get shots of the night views of Kyoto from the various view points in the gardens. Pack a telephoto if you want to shoot those, plus a big tripod to hold it all! It was hard enough negotiating the steeper parts of the gardens with what gear I did bring. Fortunately they halved the entrance fee to 500yen for the Arashiyama Hanatouro night viewing, but unlike the daytime the entry fee didn't include tea and a snack. It still kept its reputation for one of the least crowded attractions in Arashiyama. So, it was worth going there just to get out of the crowds and get photos without people continually walking in front of my camera. Also the small museum about Denjiro Okochi was still open during the night, which is worth seeing. Plus it has much nicer and less crowded toilets than anywhere nearby. Okochi-sanso is about 15 minutes walk west of the Keifuku Arashiyama Station. The road to Okochi-sanso takes you through Arashiyama's famous Bamboo Forest. If you want to avoid the congestion in the Bamboo Forest during Hanatouro (if you've seen it before) another route is via the road alongside the Katsuragawa (Katsura river) and through a park (the path through the park is lined with lanterns during Hanatouro). For this photo I used a Nikon D700 camera, an AF Nikkor 24f/2.8D lens and cable release mounted on a sturdy tripod. It was captured as a RAW (.NEF) file and post processed in DxO Optics Pro. Adjustments made included: Default camera and lens corrections; DxO Smart Lighting applied; DxO Clear View applied; Reducing highlight levels; increasing microcontrast levels; increasing vibrancy; and applying PRIME noise reduction. It has been few months since my last BLOG post. This time of year tends to be very busy for me work wise. A couple of nights ago I got the chance to see this year's Arashiyama Hanatouro, which is currently on every night (5pm-8:30pm) until Sunday 20th of December. This year the course has expanded which helped remove a bit of congestion after the Bamboo Forest, but the Bamboo Forest section was more congested that ever! What is very special this year is thanks to the warmer weather, there is still plenty of maple and ginkgo colour around. 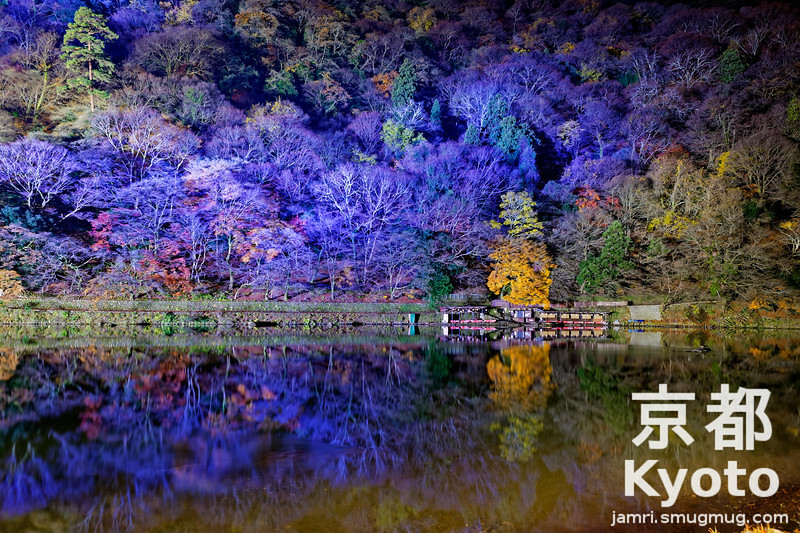 This photo was taken from the side of the Katsura River, at the western limit of the light up on the mountain. The Sakura (Cherry Blossom) trees have lost their leaves, so the bare branches reflect the blue lights. However, this year there are still plenty of Momiji (Japanese Maples) and Ichou (Ginkgoes) with colourful leaves. I think it made this scene even more spectacular to look at than usual. The location for this photo was near a little shop/restaurant that appeared in a previous BLOG post of mine. I stopped there to buy a sports drink and as I sat drinking it on the outdoor benches, I realised I needed to set up the tripod and take some photos! Thanks to a new route added to this years Hanatouro course that lets you return south from the Bamboo Forest, returning to the Hankyu Arashiyama Station is quicker. There are three railway companies serving Arashiyama. Hankyu's Arashiyama Station is on it's Arashiyama branch line, connecting to it's Kyoto-Osaka line at Katsura Station. JR's Saga-Arashiyama Station on it's Sanin (Sagano) line which will take you to JR's Kyoto Station with connections to almost everywhere! There's also Keifuku's Arashiyama Station where you can catch light rail trains that can get you to various places in the North West of Kyoto city as well as to the Kyoto Subway and the Hankyu Railway. There are also buses to Arashiyama, but forget them if you're heading back to the centre of Kyoto, because they are way too slow compared to the train options. Buses can be useful to take you from Arashiyama to some of the sites further out or to sites in the North West of Kyoto city if they are not near the Keifuku line. For this photo I used a Nikon D700 camera, an AF Nikkor 24f/2.8D lens and cable release mounted on a sturdy tripod. Since this area was so dark I had to use the bulb setting and my wrist watch to time the exposure. It was captured as a RAW (.NEF) file and post processed in DxO Optics Pro. Adjustments made included: Default camera and lens corrections; DxO Smart Lighting applied; DxO Clear View applied; Reducing highlight levels; increasing contrast and microcontrast levels; increasing vibrancy; and applying PRIME noise reduction. Here's the view that might await you if you walk from Kiyomizu-dera (Kiyomizu Temple) to Yasaka-jinja (Yasaka Shrine), as I've done a number of times alone or with visitors. After checking out the Shrine and leaving from the west gate you hit Shijo Dori (Shijo Street), the main street of Kyoto's entertainment district Gion. The night is young and in Gion you'll find all kinds of all kinds of entertainment to suit all tastes and budgets. From street side eateries to high-end traditional restaurants. Cafes, Bars, Night clubs, a Kabuki Theatre, Pachinko (a kind of vertical pinball in which you can win more balls that can be exchanged for prizes) parlors and "Ochaya" (traditional teahouses where Geisha entertain), it's all in Gion. 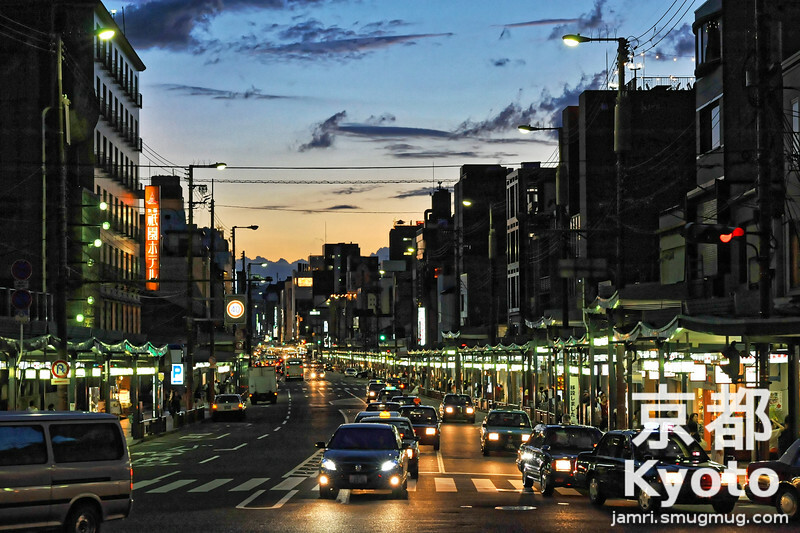 The Gion district of Kyoto is centred by Shijo Dori which runs east west. 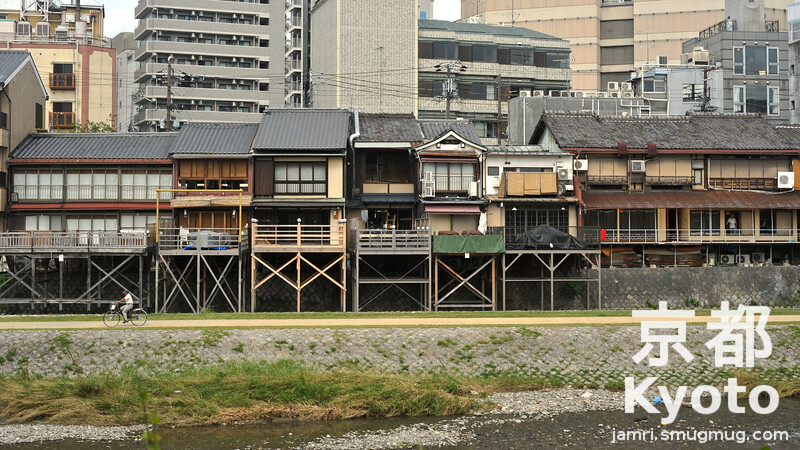 The western End of Gion is the Kamo River. Gion extends beyond the eastern end of Shijo Dori and Yasaka-jinja. Probably the best place in Gion to check out in the early evening is Hanamikoji Dori (Hanamikoji Street) which is two blocks west of Yasaka-jinja. The southern side (across Shijo Dori) of Hanamikoji Dori is full of traditional buildings. The nearest train stations are Gion-Shijo on the Keihan Railway's Main Line and Kawaramachi on the Hankyu Railway's Kyoto Line. I took this photo over 4 years ago now, but I had overlooked it. Recently I purchased DxO Optics Pro and I was looking though some older photos and when I saw this one and decided to see what I could do with it in DxO Optics Pro. This photo was captured with a Nikon D700 camera and an AF Nikkor 85f/1.8D lens. I made the following edits in DxO Optics Pro: default camera/lens corrections applied; DxO Smart Lighting applied; Shadows regions brightened slightly; DxO ClearView applied; Microconstrast increased; Vibrancy increased. If you're ever in Kyoto (especially the downtown area) in summer it can get really hot. I'm talking about the real summer mid July through to late August, not the first half which is the summer monsoon. 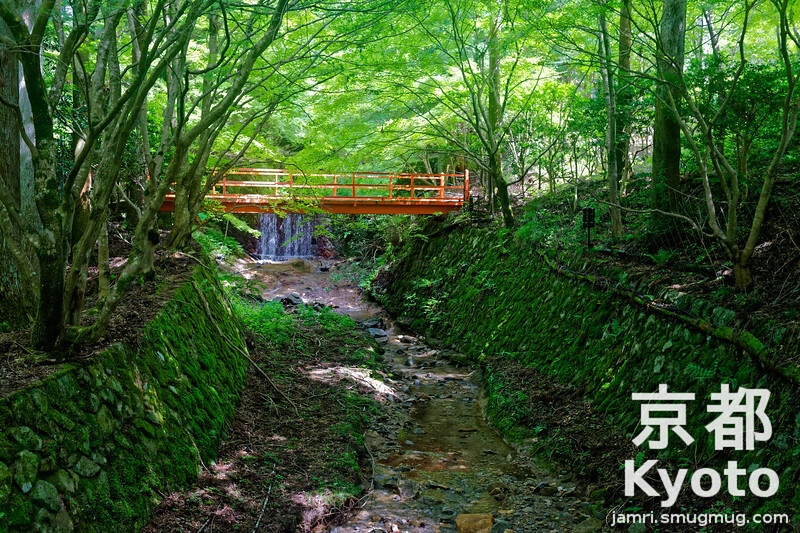 Now there are a few places in Kyoto prefecture where you might be able to find a little relief from the summer heat. Places like Miyama, Kurama and Kibune are all good. Another good place that always cooler than the downtown is Ohara and that's where the photo for this BLOG entry was captured. When most people were away for Obon (a Buddhist festival during which people visit their ancestors graves), we didn't have any classes to teach. While we did have a bit of preparation and admin work to get done during that time, we got the chance to spend about 4 hours in Ohara. Not only was the weather a little bit cooler, the place is full of greenery which makes air so much fresher. We had lunch at very delicious traditional restaurant, before having a look a Sanzen-in (a very famous temple in Ohara), as well as bit of a wander through the greenery. I'm planning to post another couple of photos from Ohara to this BLOG sometime later. Ohara is set in a valley in the mountains about 12km North of downtown Kyoto. There are no trains to Ohara, so either you'll have to catch a bus or go by private transport. What is not told to you in many travel guidebooks and on other websites is that the best place to catch the bus to Ohara is from just outside Kokusaikaikan (K01) Station on the Kyoto Subway's Karasuma line. Catch a No. 19 Kyoto Bus Co. from stop 3. This photo was taken with a Nikon D700 camera and an AF Nikkor 35f/2 lens with a circular polarising filter. It was captured as a RAW (.NEF) file and post processed in DxO Optics Pro. I made the following adjustments: Slight adjustments to the tint to make it greener; applied the DxO Smart Lighting filter; toned down the highlights; applied the DxO ClearView filter; increased the Microcontrast; increased the vibrancy; applied PRIME noise reduction; and applied default camera/lens corrections. 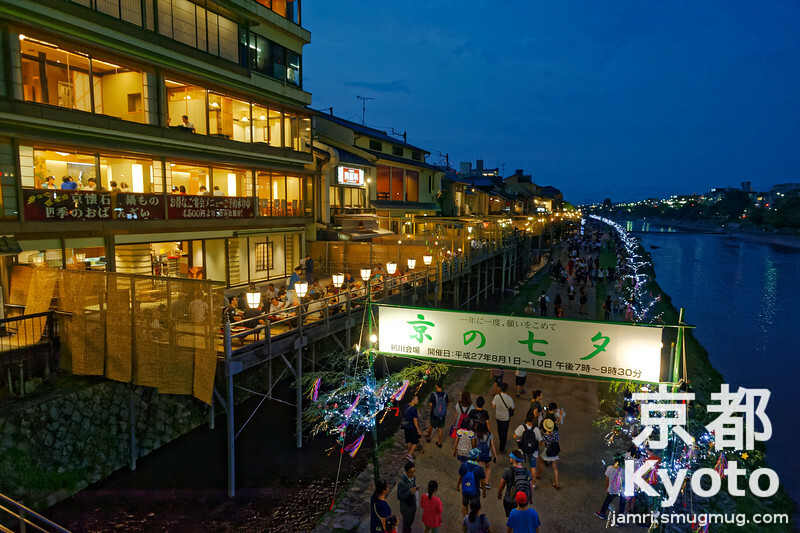 If you're around the Kansai area at the moment, check out the Tanabata Festival on the banks of the Kamo River (Kamogawa) between Shijo-dori and Sanjo-dori. It's on every night (from 7:00pm to 9:30pm) until August 10th. Tanabata is a festival celebrating the meeting of two stars (see my previous BLOG on Tanabata). What's unusual about the current festival in Kyoto is that it's neither right date for it by the Gregorian calendar nor by the Lunar calendar. However if you choose the date by the Lunar calendar this year it clashes with the Obon Festival, so perhaps that's why they chose to hold it now in Kyoto. My local area Tanabata Festival is always by the Gregorian calendar that is July 1-7. If you don't mind spending a bit of money, you could book an outdoor table at one of the fancy restaurants along the river. Otherwise grab a bento box or another kind of takeaway food and sit on the banks of the river. The nearest train stations are: Kawaramachi on the Hankyu Railway's Kyoto line; Gion Shijo or Sanjo stations on the Keihan Railway's Main line; Or Sanjokeihan on the Kyoto Municipal Subway's Tozai Line. This photo was taken with a Nikon D700 camera and an AF Nikkor 24f/2.8D Lens. It was captured as a RAW file. I made the following processes to the RAW file in DxO Optics Pro: Default camera and lens corrections applied; DxO Clear View Filter Applied; PRIME noise reduction applied; Microcontrast increased; Black areas brightened; and Highlights darkened. Higashi Otani Mausoleum is a Buddhist graveyard in Kyoto, which offers some good views of the city from the grounds. It was not open in the evenings during the Higashiyama Hanatouro, but the gate was lit up for the event. Usually the graveyard is open in the day time. In the summer during Obon (a Buddhist festival for the departure of the spirits of the dead held in mid August) the graveyard is open and lanterns are placed on the tombstones. Not all graveyards in Japan are open to the public like this one is, please be respectful if you visit as family members regularly visit to pay their respects to departed ancestors. It is located almost due east of Yasaka-jinja (Yasaka Shrine). From the South gate of the shrine cross over the road and soon after you'll see a pathway on your left. The pathway leads up to the gate in this photo. This photo was captured with a Nikon Coolpix P7100 camera on a tripod as a RAW (.NRW) file. It was a very difficult getting the white balance right on this image because there were multiple kinds of lighting used to light this scene. In the end I opted to convert it monochrome in DxO. I exported as .TIF file from DxO into the Gimp where applied split toning to give it the brown colour. I think the brown colour looks better than grey as it pretty much matches the gate's actual colour. Here's another photo from this year's (2015) Higashiyama Hanatouro. I know it's not anywhere near the time of the year of that festival because it's held every March, but other than the Hanatouro lanterns the rest of the scene can pretty much be experienced all year round. 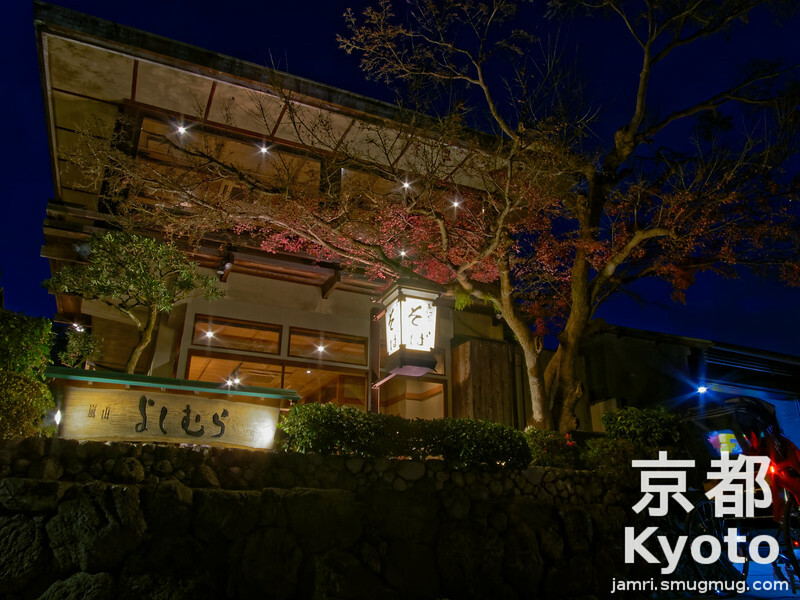 Kyoto is the place to experience fine dining in Japan. I'm not sure on the prices of this place in particular, but it looks pretty high end. If it is truly a Kaiseki Cuisine (a multi course meal consisting of finely hand crafted food each with matching plates) place you can expect to pay from 12,000yen per head for dinner (or from 7000yen per head for lunch). Another reason I'm posting this BLOG today is over the last couple of days, in my spare time I've been experimenting with some photo editing techniques in preparation for something I'm going to post on my other website in the near future. As a result of some learnings from that editing I decided to revisit the shot I've posted today. This photo was captured with a Nikon Coolpix P7100 camera on a tripod as a RAW (.NRW) file. It was a very difficult getting the white balance right on this image because there were multiple kinds of lighting used to light this scene. In the end I opted to convert it monochrome in DxO. I exported as .TIF file from DxO into the Gimp(*) where I did some more tweaking to the image and applied split toning to give it the brown colour. I think the brown colour looks better than grey as it pretty much matches the building's actual colour. Split toning allows you to covert certain ranges of shades of grey to shades of another colour. I only applied the brown colour to the mid tones in today's photo. I've seen some other people's photos where they've applied different colours to different ranges for a very cool effect. The things we can do with our photos in software today are only limited by our imagination, get creative folks! (*) Note: It is possible to do split toning in DxO if you purchase the additional Elite Film Pack, but the Gimp is free software (open source) and I'm a pretty frugal guy! Over the last five years that I've been going to the Higashiyama Hanatouro. I've tried on a number of occasions to get a good shot of Gion Tower (which is part of Daiunin Temple), but until this year I never found a good vantage point. 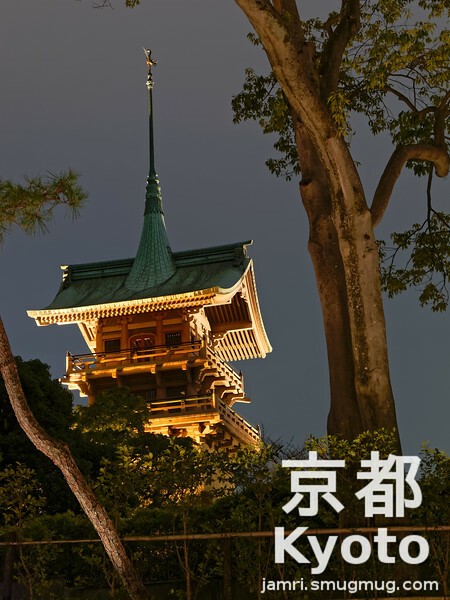 Although the tower is lit up for the Hanatouro, the temple is closed. One option could be to go to Kodai-ji, because there is a good view of Gion Tower from one part of the Kodai-ji grounds. Kodai-ji is open for the Hanatouro, but it cost money to enter and it seems always to be very crowded during Hanatouro, so I've not bothered with that option. This year I was glad to find a good vantage points from one of the lesser traversed paths of the Hanatouro. Gion Tower is just to south of Yasaka Shrine, which is at the eastern end of Shijo-dori (Kyoto's main street). I took this photo from the path that leads up to Otani Mausoleum. During Hanatouro the western end of of this path has lanterns made by university students, it was near those lanterns I got this photo. This photo was taken with a Nikon P7100 camera on a tripod. The original photo was captured as a raw(.NRW) file, I used DXO Optics Pro to edit it. I made the following adjustments: Highlights were increased; Overall exposure reduced; Contrast and Microcontrast increased; Vibrancy and Saturation increase; Prime Noise Reduction applied; and default camera corrections applied. Maruyama Park (Japanese "Maruyama Koen") is by far the biggest free site of the Higashiyama Hanatouro. This year as in 2013 Maruyama Park was the starting point for my Hanatouro explorations. However this year was the first time I got to see the Bamboo Lanterns in the stream (albeit a dried up one!). In 2013 I missed this part of the park for some reason. Last year I intended to finish at Maruyama Park, but spent way to long at Sho-ren-in, so I only made it to outside the gate of Chionin before lights out. If you don't live near Kyoto and you want to see a lot of the Higashiyama Hanatouro, make sure you spend a couple of nights in Kyoto. I was also glad I took a few shots of these lanterns, because in all of the others the people crossing the bridge were wearing light coloured footwear which stood out too much. The black shoes in this shot still show the human presence, but don't distract so much from the bamboo lanterns. I would have never have noticed this on the back of the camera, but it was only when I uploaded them to the computer that I saw it. Always take a few shots of each scene just to be sure. Maruyama Park is just to the North of Yasaka Shine (Japanese "Yasaka Jinja"), the nearest train stations are Gion Shijo on the Keihan Railway's Main Line and Kawaramachi on the Hankyu Railway's Kyoto Line. Other than Hanatouro times Maruyama Park is also a good a place for seeing the Sakura in bloom, the place has quite a festival atmosphere at night during the Sakura blooming times. This photo was taken with a Nikon P7100 camera on a tripod. The original photo was captured as a raw(.NRW) file, I used DXO OpticsPro to edit it. I made the following adjustments: Custom White Balance Adjustments; Increased the Micro Contrast Levels; DXO ClearView filter applied; DXO Prime noise reduction applied; and default camera corrections applied. We've had a bit of a warmer week than usual for this time of the year up until yesterday. People are predicting an early bloom of the Sakuras this year. It still hasn't officially started in Kyoto, but the buds are looking like they are going to burst into bloom any day now. This photo was taken at this years Higashiyama Hanatouro, the Sakuras in the photo were part of a flower arrangement. So the branches had been cut from a tree and probably kept somewhere warm before putting them on display at the Higashiyama Hanatouro so they'd bloom early. The Higashiyama Hanatouro was also about a week earlier than usual this year. I'm not sure why, but maybe they didn't want it to clash with Michelle Obama's recent visit to Kyoto. Normally the Higashiyama Hanatouro finishes on the spring Equinox. If you are planning to come to Kyoto for either Arashiyama or Higashiyama Hanatouros please check out the Kyoto Hanatouro website for the exact days. This photo was taken with a Nikon P7100 camera on a tripod. The original photo was captured as a raw(.NRW) file, I used iPhoto on the Mac to edit it. I made the following adjustments: the exposure was brighten slightly; the definition was in increased; and the shadows were brightened. Arashiyama in the North Western outskirts of Kyoto city is beautiful at any time of the year, but I think that during the Autumn colour change it is at its best. The colour change usually peaks from mid November through to early December. As of today there still is plenty of colour around. However the weather is forecast to become wintery from tomorrow onwards, so I'm not sure how much longer the leaves will stay on the trees. The photo I posted today was taken back in November 2010, on a perfect clear sky autumn day. On that day I took a number of photos which I've posted to this BLOG, or I'm planning to post later. Even though I live only 25minutes away from Arashiyama, getting there on a perfect day for autumn colour change photography doesn't happen every year, with all my various work, church, and other commitments. 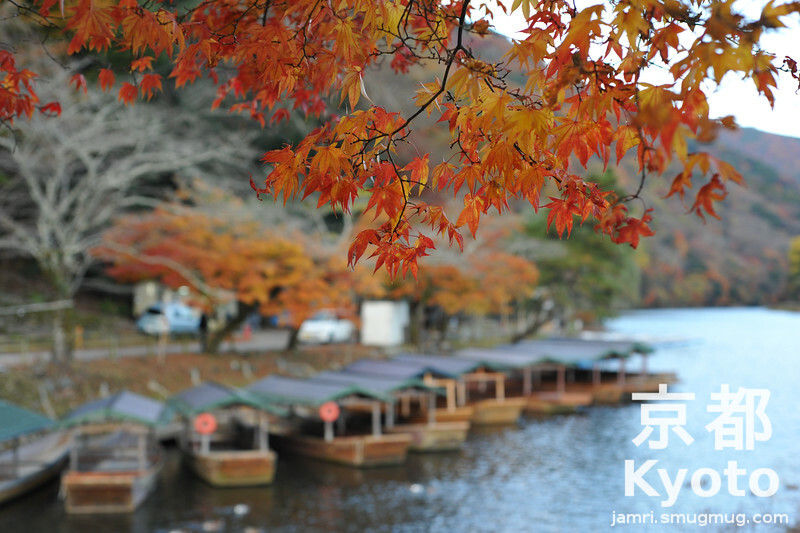 So, if you happen to be in Kyoto on vacation during Autumn colour change, make the most of it. I took this photo from at the Western End of Nakanoshima (an island in the river). There nearest train station is the Hankyu Arashiyama, although it's not so far from Keifuku (Randen) Arashiyama station either. If you're coming to Arashiyama in the next few weeks, even if the autumn leaves have all fallen, the Camellia Sasanquas have started to bloom and usually peak at the end of December. Also in December is the big event for Arashiyama, the Arashiyama Hanatouro when there are beautiful light ups of forests, temples, shrines and streets for 10 nights (this year from Friday the 12th to Sunday the 21st). This photo was taken with a Nikon D700 camera and an AF Nikkor 50f/1.8D lens. This is the jpeg straight from the camera, no post processing has been performed on this image. You may have noticed that I post a lot of BLOGs about this particular shrine. Well, it always has something to see in each month of the year. Secondly, for most of the year it's a pretty peaceful place to relax without the crowds that turn up at the more famous places. Thirdly, it's only about 15 minutes walk from my house, so it's easy for me to get to. Actually, I want to tell you a story about how I found out about this place. About two months prior to us moving to Japan, we made a short trip to Japan to get my visa activated and to look for a house to rent. On that trip I took some photos nearby Nagaoka Tenmangu which I published on an older website of mine. I had geotagged the photos and soon after I published them a gentleman from France sent me an email asking me if I had taken any photos at the pond in the area. I looked around on Google Maps and found a large pond just to the west of where I had taken the photos. On my second morning after moving to Japan I headed out to this place and took some photos, and I have gone back regularly ever since. The photo I'm posting today was taken about 2 years after I moved to Japan. It was my first November with the Nikon D700 camera, so I took a lot of photos that November. I recall I went to Nagaoka Tenmangu 3 times that November as well as a number of other spots in Kyoto. Nagaoka Tenmangu Shrine is about a 5 minute walk west of Nagaoka Tenjin Station on the Hankyu Kyoto Line. If you're one who insist on always using JR trains, then the nearest JR Station is Nagaokakyo, but it's about a 15 minute walk to the west of there or you could catch a bus from there. This photo was taken with a Nikon D700 camera and an AF Nikkor 35f/2 lens with a circular polariser. No post production has been done on this photo. 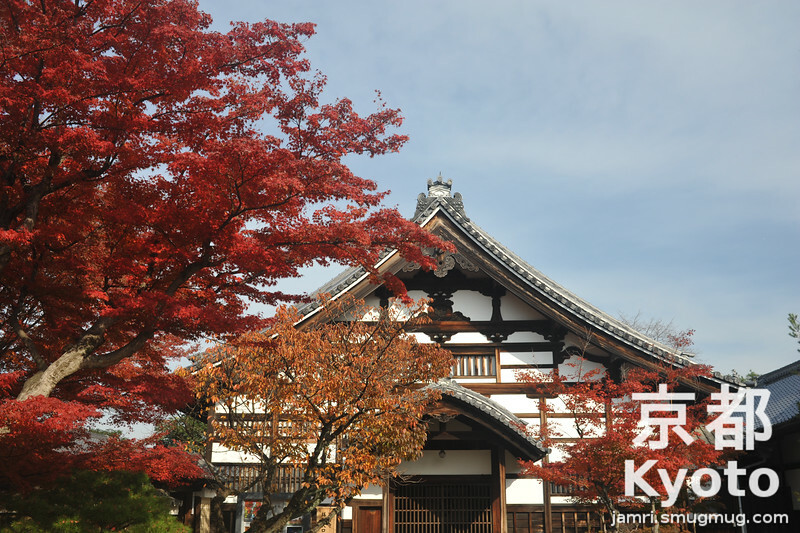 Autumn leaves aren't the only botanical thing to see in November in Kyoto. 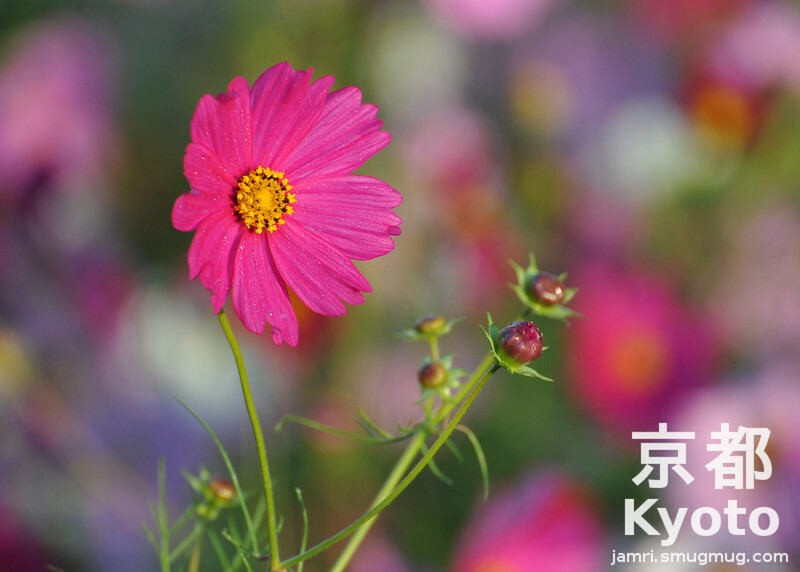 During the month there are various festivals celebrating the flowering of the Chrysanthemum. One very special festival is the one at Daikaku-ji in the Saga district of Kyoto city's Ukyo ward. Another big Chrysanthemum festival is at The Kyoto Botanical Garden. The Saga Chrysanthemum (Japanese "Saga-giku") has brush like petals, it originally grew naturally on an Island in the huge pond at Emperor Saga's villa. Later this villa was converted into Daikaku-ji (a Buddhist Temple). 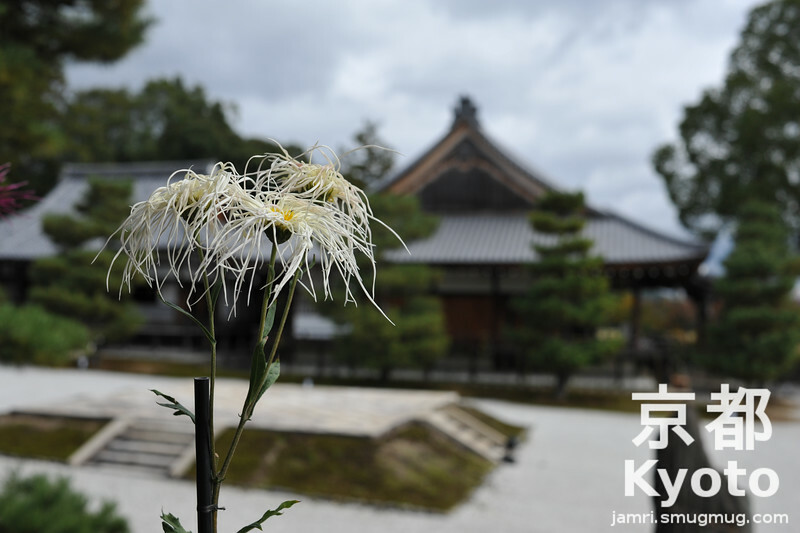 Every year in November many Saga Chrysanthemums are displayed around the temple buildings and in special booths. There is also a competition which growers compete in to grow the tallest Saga Chrysanthemums. The nearest train station is the JR Saga Arashiyama station, which is 17 minutes walk away. If that seems like a too long walk for you, consider taking a taxi from the station. Another possible way of getting there from the centre of Arashiyama is by rickshaw, which you can hire from near the Togetsukyo Bridge. Today's photo was taken with a Nikon D700 camera and an AF Nikkor 35f/2D lens. This is the original jpeg from the camera, no post production has be done on the image. Well since I've now done a full year of flowers of the month, I've decided to discontinue those kinds of entries to this BLOG. In case you missed last year's flower of the month for November, it's the Chrysanthemum. However what brings more people out snapping photos in November, than Chrysanthemums, are the spectacular autumn colours on the various kinds of deciduous trees in Kyoto. Probably the best trees to see are the red leaves of the Japanese Maples ("momiji" in Japanese), however the yellows of the Ginkgoes ("ichou" in Japanese) are also very beautiful. Another autumn colour you'll see a lot of in Kyoto a couple of weeks earlier than the Japanese Maples and Ginkgoes are the orange tones of the Cherry Blossom trees ("sakura" in Japanese). The photo I've posted today is from Kodai-ji (a Buddhist Temple) in Higashiyama, Kyoto. It is a very good spot for viewing Japanese Maples in a tradition setting. There are also a few Cherry Blossom trees there as well. The temple grounds also provide a some good views of other parts of Higashiyama and Gion. According to the Lonely Planet Kyoto guide, Kodai-ji is only 5 minutes walk from the Higashiyama-yasui bus stop (Bus 206). If you been reading this site for a while, you'll know I dislike catching buses in Kyoto city (too crowded and slow). I walked all the way up to Kodai-ji from Kawaramachi Station then back again, the exercise was good and got me warm on the cool autumn morning. This photo was taken with a Nikon D700 camera and an AF Nikkor 35f/2D lens with a circular polarising filter. This is the jpeg direct from the camera, no post processing has been done on this image. The first BLOG entry on this site was on Kinkaku-ji (the Temple of the Golden Pavilion). In that BLOG I stated that I had a few photos from there that I want to eventually BLOG about. Today’s photo is from before I moved to Kyoto, it was taken in 2007 when I was just visiting. A black and white version this photo appears in my wife’s book "Back to Japan". The pavilion was first built as a wealthy person's tea house, he left it to a Buddhist group in his will, so when he died it became a temple. The main building is a modern reconstruction as the original was destroyed in a fire. The current building has much more gold coating on it than the original. Unfortunately this temple is not near any train stations. You need to get there by bus, taxi or private transport. Ignore all the travel guides which tell you to catch a bus from Kyoto Station to this temple, you'll waste half your day on crowded buses. The quickest buses to Kinkaku-ji go from near Emmachi Station on JR's Sagano line, Saiin Station on the Hankyu Railway's Kyoto Line, Kitanohakubaicho Station on Keifuku Railway's Kitano Line, or from near Nijo-jo Mae Station on the Subway. This photo was taken with a Nikon D50 and a Sigma 10-20f/4-5.6 lens. The following adjustments were made to the image in iPhoto: The definition was increased, the highlights reduced and the shadows brightened. 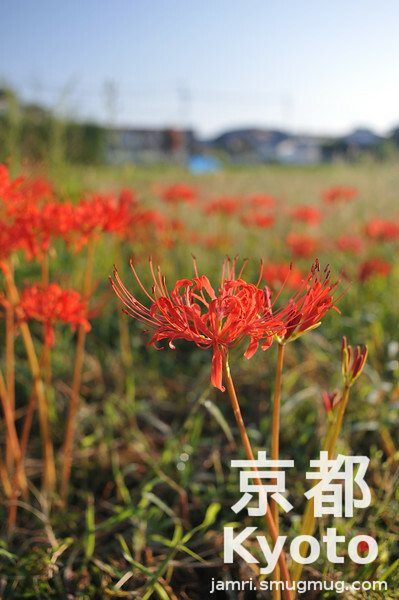 In October usually just after the harvest, the Higanbana (Red Spider Lilies) sprout up mostly along the edges of the fields. There are some traditional beliefs about these being associated with the ascending spirits of the recently departed. Perhaps it was a way of keeping children from touching these flowers because they are poisonous. I took this photo back in October 2010, that year I was keeping track photographically of the changes in a rice field. I find the whole life cycle of the rice fields here in Japan very fascinating. Living near rice fields certainly helps you appreciate more the work that goes into feeding the population and the delicate balance of nature. This photo was taken with a Nikon D700 camera and an AF Nikkor 35f/2D lens with a circular polarising filter. This is the jpeg straight from the camera, no post processing has been performed on this image. This is my second BLOG post on Nijo-jo (Nijo Castle), the previous post was of a photo of one of it's more palatial parts. 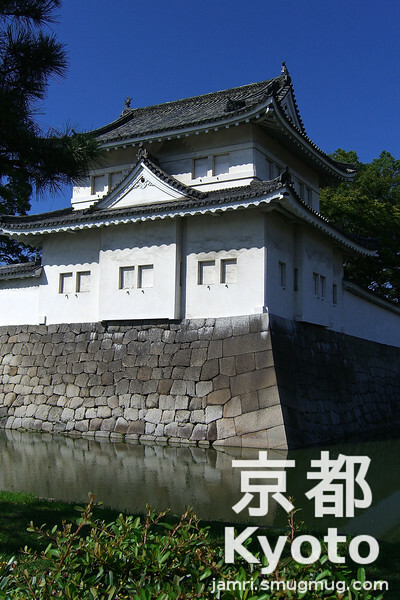 This photo however is a part of it that looks more like a typical Japanese castle. The grounds of Nijo-jo are pretty huge, and it's one place I'd love to get back to some time soon. I've only been there once and that was when I was visiting Kyoto as a tourist. Maybe I should get back there on a cold but sunny winter's morning, when there might not be so crowded. Low winter sunlight usually looks great on photos of traditional buildings. Nijo-jo castle was built as the Kyoto home for the Tokugawa Shoguns, although they mostly stayed in Edo (now Tokyo). 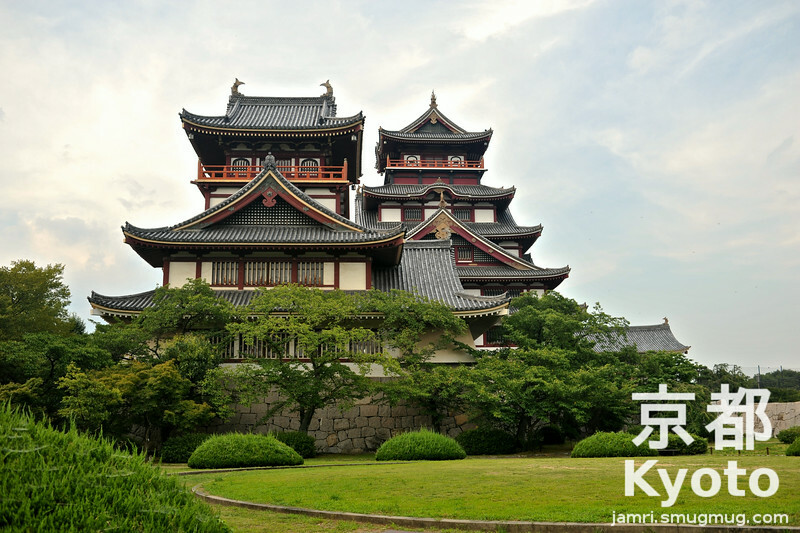 Since the land was at peace during the rule of the Tokugawa Shoguns, it was built more like a palace than the typical defensive castles that you find in many places in Japan. It is actually very similar to the Kyoto Imperial Palace, which I guess was done as deliberate assertion of the Tokugawas power. The easiest way to get to Nijo-jo castle is by the Subway. There's a subway station exit right outside the front gate. The station is on the Subway Tozai Line and it's called Nijo-jo Mae. 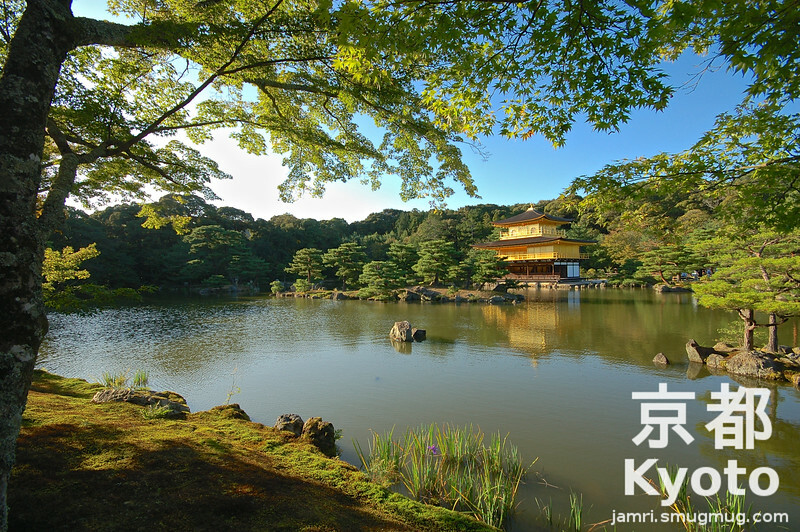 If your planning to see Kinkaku-ji (the Temple of the Golden Pavilion), then head to Nijo-jo first on the subway and then catch a bus to Kinkaku-ji from nearby Nijo-jo. Trust me it's much better than catching a crowded and stuck in traffic bus all the way from Kyoto Station to Kinkaku-ji. This photo was taken with a Casio EX-Z850 camera. In iPhoto I made the follow edits to the jpeg from the camera: I added sightly more definition; I boasted the shadow areas and toned down the highlights. On the Western Edge of Kyoto Prefecture at the base of Mount Tenno (Japanese "Tennozan") is a property known as Asahi Villa. Originally built by a wealthy businessman named Shotaro Kaga based on tudor style houses he had seen in England. After his death the building fell into disuse, but more recently it was restored and turned into a museum. A proportion of the funds for the restoration came from the Asahi Breweries, I'm not sure if there's a connection between Shotaro Kaga and Asahi. In addition to the Tudor style villa and this rest stop, one of the other buildings on the property is an Art Gallery designed by famous Japanese architect Tadao Ando. Although a recent addition to the property, it has been designed in such a way to blend in with the scenery. You enter the gallery through a glass walled walkway that takes you underground to the main gallery. The main attractions on display when I visited were a few paintings by Claude Monet. In the main villa various works of Mingei artists are on display. The top floor offers good views of the surrounding area and there's a cafe. There's an entrance fee for to see the main villa and the art gallery, but it's free to enter the rest stop where there's some vending machines selling drinks. Its pleasant surroundings make it a good place to stop for a break after hiking around the Mount Tenno area. 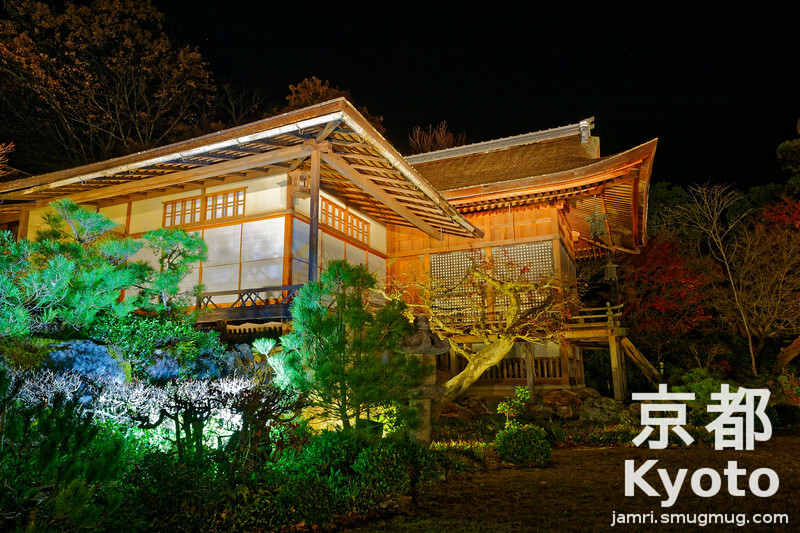 Asahi Villa is in Oyamazaki Town in Kyoto Prefecture. There are two train station near the villa. On the JR Kyoto line the station is called Yamazaki. On the Hankyu Kyoto line the station is called Oyamazaki. Around the two stations there are a number of nice restaurants and cafes, the best of them is the Hermit Green, but it often has long queues on weekends. This photo was taken with a Casio EX-Z850 camera. I made the following edits to the jpeg image from the camera: It was cropped to an 8:10 ratio; The contrast and saturation were increased slightly; The definition was boosted; The highlights were darkened; The shadow areas brightened; And the white balance was made slightly warmer than the original. Enryaku-ji is a Buddhist Temple and Monastery complex that covers part of the slopes of Mt. Hiei which is on the border of Kyoto Prefecture and Shiga Prefecture. Officially this temple is in Otsu city of Shiga prefecture, so I hadn't thought to add it to my Kyoto Photo BLOG before, however it does have a strong historical attachment to Kyoto. Not only that, it's also easily accessed from Kyoto and it's way more tranquil than most of the famous temples in Kyoto city. The temple and monastery complex is very sprawling, spread out through a forest which makes for good hiking. I've titled this photo secret garden, because after about an hour of hiking through forest trails we found a building that was hidden from the main tracks. When we went down to take a look we found a small door in the wall and through that door was a beautiful zen garden. I don't know how many others have found this garden, there was no one else around when we went there. Enryaku-ji can be accessed from Kyoto via the Eizan Main Line departing from Demachiyanagi station in the city's north and changing on to the the Eizan Cable Line at Yase-Hieizan-guchi. Another way and often quicker is to take a JR train from Kyoto station via the Kosei line to Hieizan-Sakamoto in Otsu, Shiga Prefecture, where you can transfer to a bus and then the Sakamoto Cable Car. It's also possible to climb Mt. Hiei and a good place to start the climb is near the Sakamoto Cable Car station. This photo was taken with a Nikon D50 camera and an AF Nikkor 50f/1.8D lens. This is the jpeg straight from the camera, no post processing has been performed on this image. By the way if you're looking for a good camera to start getting serious about photography, I recommend getting a secondhand Nikon D50 if you can find one. It's so far Nikon's only budget dSLR that has a built in focus motor. All of the newer budget dSLRs that followed (i.e. the D40, D40x, D60, D3000 series, D5000 series) lack this feature which means they won't autofocus with the cheaper AF lenses, you need to buy the more expensive AF-S lenses to get autofocus with those cameras. I loved using the AF 50f/1.8 on the D50 when I had the D50. On the D50 it acted like a 75mm lens, which was great for portraits and other shots requiring a short telephoto. It's always a bit controversial to choose a recent import to Japan as a flower of the month, however if you've ever been around this part of Japan in October you've probably seen these flowers. It seems they grow almost anywhere there's a vacant bit of land, sometimes they are planted in rice fields after the harvest. Many people (myself included) grow these in pots. It's hard to think of a more beautiful scene than a field full of purple, pink and white Cosmos flowers swaying in a gentle breeze on a lovely October's afternoon in Kyoto. For those of you who've been wondering what's happened to me, I've been extremely busy for the past few weeks. Things should quieten off a bit from November. Hopefully I'll get some time then to hand out a few more promotional photo cards to tourists, attend a meet up of content creators or two, and most importantly get out and photo the beautiful autumn colours in Kyoto. This photo was taken in a field behind the Den Yakiniku Restaurant near the Hankyu Nishiyama-Tennozan station. That place is very much in flower right now, however the field is only about half the size as it used to be thanks to a new apartment building (called "manshion" in Japanese) being built there. However I'm sure you can find plenty of others anywhere in the outskirts of Kyoto. This photo was taken with a D700 camera and an AF-S VR Zoom-Nikkor 70-300f/4.5-5.6G IF-ED lens. The only editing I did to it was to crop it a bit. No, it's not a misspelling of a Middle Earth creature! Ukai is the Japanese word for Cormorant fishing, an ancient practice of using Cormorants to catch sweetfish (called "ayu" in Japanese). A group of trained Cormorants with on leashes attached to rings on the Cormorants' necks which prevent them from swallowing the fish. The fishing is done at night by firelight. There are two locations in Kyoto where you can see Ukai: in Arashiyama (where this photo was taken) and in Uji. 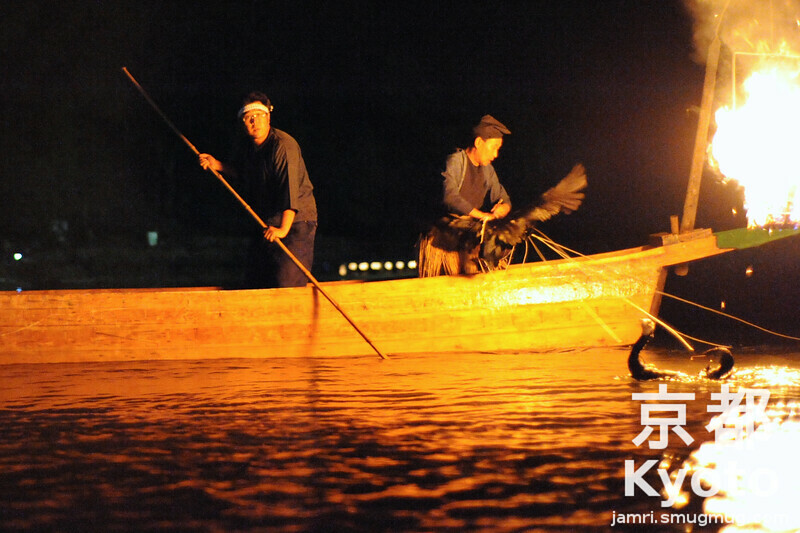 The season in Arashiyama runs from July 1st to September 16th each year, with fishing starting just after dark. The season in Uji runs from June 14th to September 21st. In Arashiyama the nearest train station to the Ukai is Arashiyama Station on the Hankyu line. To get a good view catch one of the boats from the jetty about 65m to the South of the Togestukyo bridge. It's possible to get a ticket for a seat on a boat or hire a boat and driver. This photo was taken with a Nikon D700 camera and an AF Nikkor 50f/1.8D lens. This photo has been cropped and editted in iPhoto. 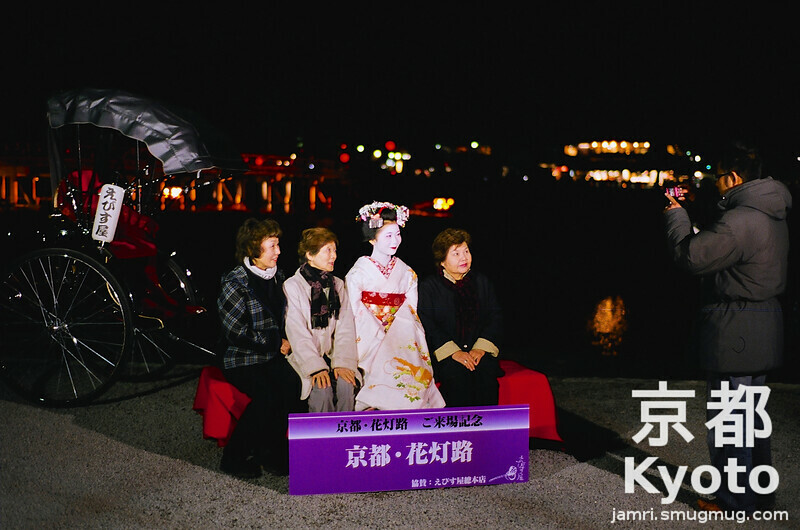 When I first moved to Kyoto there was a tourism marketing campaign going on with the slogan "Romantic Kyoto". The problem was none of the photos on the posters looked all that "romantic" to me. So I came up with an idea to snap romantic street candids in Kyoto. 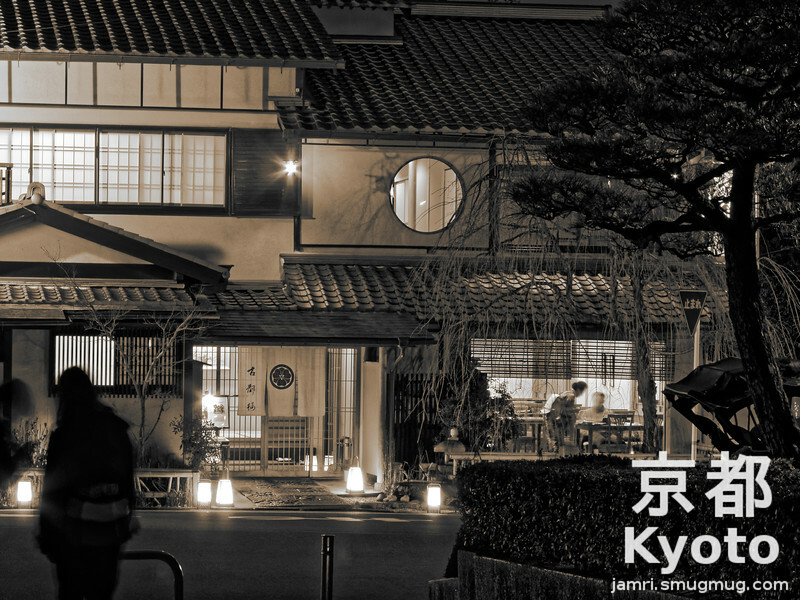 So far this is my favourite of my "Romantic Kyoto" photos. I took this photo at the just inside the gate of Yasaka-jinja (Yasaka shrine) looking towards the Shijo-dori in Gion. 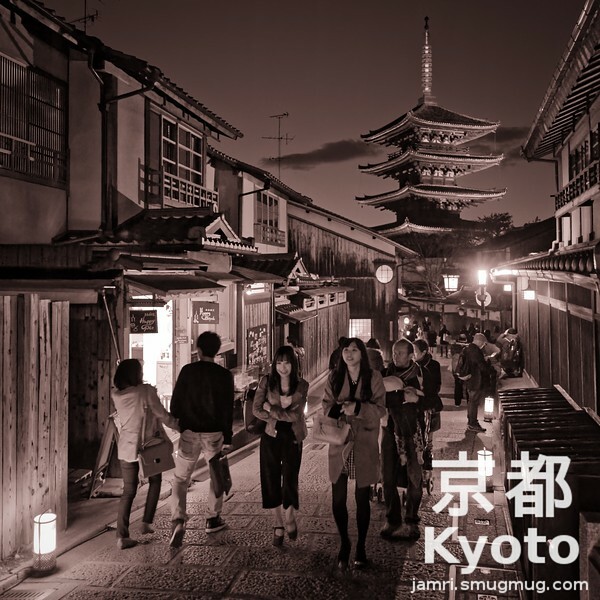 If you have your own "Romantic Kyoto" photos maybe you could let me know via the comments or on twitter or google plus. Unlike many attractions in Kyoto, Yasaka-jinja has no entry fee. It is located at in Gion at the eastern end of Shijo-dori. The nearest train station is Gion-Shijo on the Keihan Railway's Main Line (about 5 minutes walk). Not much further west on Shijo-Dori is the Hankyu Railway's Kawaramachi Station on the Kyoto line. The shrine is open 24hrs. It's also a place that Geisha frequent. This photo was taken with a Nikon D700 camera and an AF Nikkor 85f/1.8D lens. This is the jpeg straight from the camera, no post processing has been performed on this image. As the summer heat dies off and we move into the cooler autumn weather, the nekojalashi (lit "Cat Tease", the actual English word is "foxtail") start to sprout. After my first summer in Japan it was a relief to see these (however after living in Japan for 6 years I now think winter here is more unbearable than summer). I took this photo during a walk, I spotted these growing at the edge of one road which was on a slightly higher level to the main road. So I took this photo looking down towards the main road. The yellow line is one of the lane markers on the main road. This photo was taken with a Nikon D80 camera and an AF Nikkor 35f/2D lens. This is the jpeg direct from the camera, no post processing has been performed on this image. Located in the North West of Kyoto city, Mount Atago is Kyoto prefecture's highest mountain at 924m. 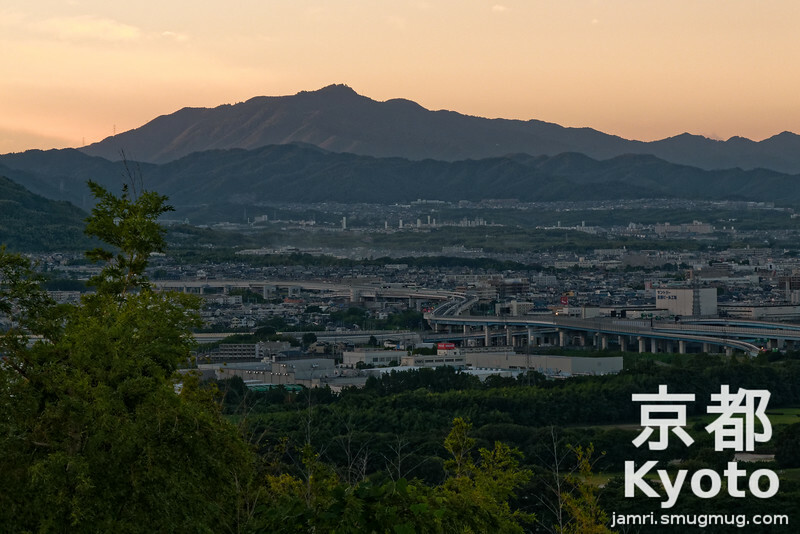 This shot was taken from Mount Otoko in Yawata city which is in Kyoto prefecture to the south of Kyoto city. Actually, I was on Mount Otoko to get a photo of the lights of nearby Nagaokakyo city for my church's website. However before lights came on I saw the last rays of sunlight touching on Mount Atago and took this photo. If you're planning to go up Mount Otoko to take photos of the view in the evening here are a few pointers. The last cable car back down the mountain departs at 6:45pm, unless you want to walk back down in the dark, go during a time in the year the sun sets well before then. As the stairs that go from near the cable car station to the lookout spot have no lights on them, bring a torch. Also bring some warm clothing in the cooler months of the year. The look out spot on Mount Otoko gives quite a wide view of Kyoto Prefecture. 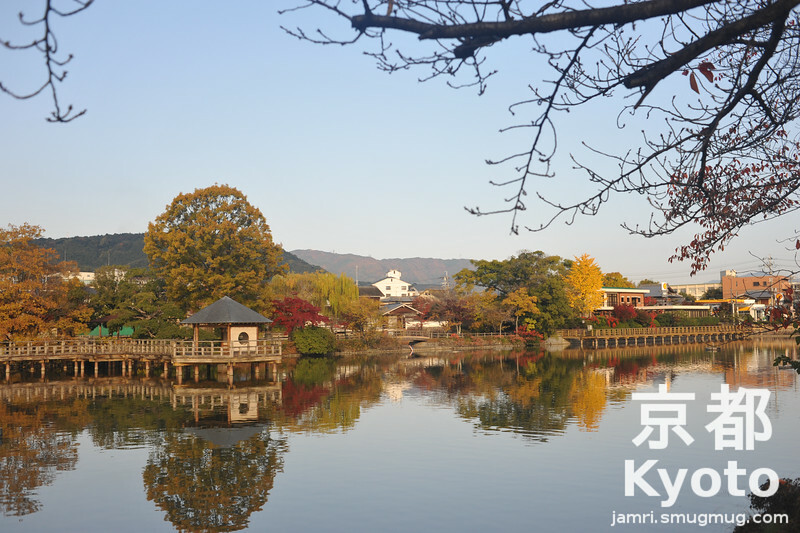 You can see Parts of Kyoto city, Nagaokakyo city, Uji city, Muko city and Oyamazaki Town. In addition to Mount Atago you can also see Mount Hiei. It also offers a good view of three rivers: Katsura-gawa, Uji-gawa and Kizu-gawa. The station Yawata-shi on the Keihan Railways mainline is right next to the cable car station at the base of Mount Otoko. It's also possible to climb Mount Otoko, but the trail is on the other side of the mountain from the train station, and I'm not sure how well lit it is at night. Also on the mountain is Iwashimizu Hachiman, one of the oldest and most important Hachiman Shinto shrines. Actually, the Kanji used in the name of Yawata city are the same as the Kanji used for Hachiman, but in Japanese unlike Chinese the Kanji can be read in many ways. One day one of my Japanese friends was telling me about "Omi-Yawata" in Shiga, but in the case of that city it's read "Omi-Hachiman", so even for native Japanese speakers the different readings of Kanji can be confusing! This photo was taken with a Nikon Coolpix P7100 mounted on a tripod. This capture was done in RAW (.NRW format) and converted to a JPEG in iPhoto. The following adjustments were applied to the RAW file: DxO default camera corrections; DxO clear view applied; White balance corrections to bring out sunset colours; Micro contrast increased; Unsharp mask applied. Next to Nakanoshima Park in Arashiyama, Kyoto there is a traditional restaurant called Nishiki. Apparently this restaurant has been run by the same family for 70 generations (if the master chef doesn't have a son, then he will either adopt a son-in-law or a nephew). I believe it first started at around the same time that Kyoto became the capital city (794 AD). Nishiki serves traditional multi course "kaiseki" meals. In each course is a work of art complete with matching plates. The waitresses are all wearing full kimonos and while the restaurant building is not as old as the business, it's also very traditional. There are a number of kaiseki restaurants in Kyoto, however no others can beat Nishiki's location. Nishiki is about a 4 minute walk from the Hankyu Railway's Arashiyama Station. The best value is to go for lunch (starting from 7,000yen per person). A dinner at Nishiki costs between 20,000yen to 30,000yen per person. Bookings are essential. This photo was taken with a D700 camera and an AF Nikkor 50f/1.8D lens. This is the jpeg image directly from the camera, no post production has been done on this image. 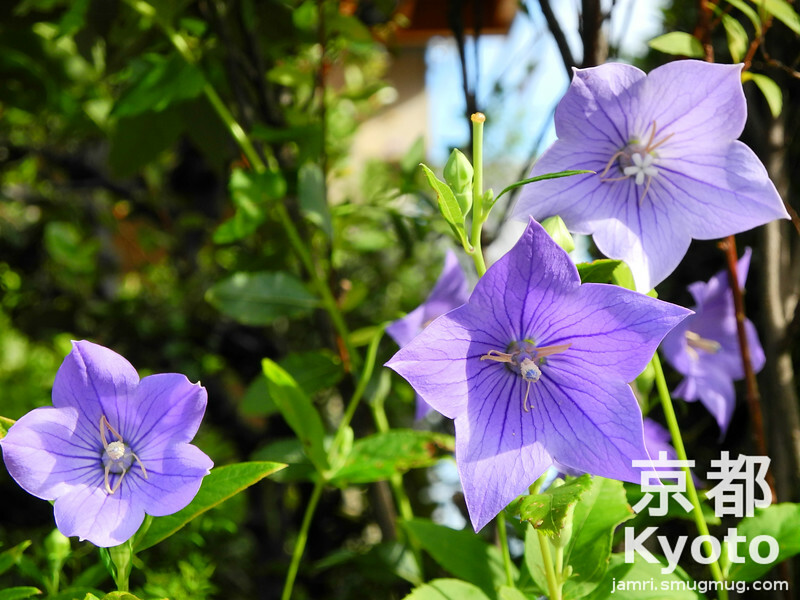 Known as "Kikyo" in Japanese, it is actually one of the 7 traditional flowers of autumn (ones that existed in Japan back in the Nara Period (710-794)). As I mentioned in the last BLOG, I've had a bit of a break from this BLOG for a few weeks, that's why I'm only posting the first "September" themed post today. Anyway this will probably be the second last flower of the month BLOG, as I started doing it from last November. Although being one of the seven traditional flowers of autumn finding good specimens of Kikyo to photograph is not so easy. It seems people prefer more recent imports these days for growing in their gardens! Keihanna Memorial Park in southern Kyoto prefecture near the border of Nara Prefecture has quiet a few, unfortunately I went there a bit too early last year, so there weren't many in bloom. Maybe I'll go back there this year, but it's a long way from my place. Well that's all for now, I have at least 8 more BLOGs in the pipeline which are "September" themed. Unfortunately I've got a lot of administration work to do over the next 6 weeks, and I'm just about to start the 3rd week of a busy class schedule. Fortunately after this week it quietens down for a while (class wise) as my kindy students concentrate on their sports carnival and art exhibition, so I'll have more time to get the administration work done and a few BLOGs hopefully. This photo was taken in Nagaokakyo city, Kyoto prefecture near the new Ritsumeikan Junior High School & High School Campus. This photo was taken with a Nikon P7100 camera. No post processing was done on the image. This photo finishes off my "August" photos for this BLOG for this year. I know it's a few weeks late, I've had a very busy time over the last couple of weeks. Today I'm posting up two blogs, to catch up a bit. I took this photo on the same day as the Geisha Tea House (2 BLOGs ago), but it's was actually near to the Kabuki Theatre in the previous BLOG. From the Tea House I took a walk along a traditional neighbourhood all the way up to Gojo Dori, from there I walked along the Kamogawa (Kamo river) back to Shijo Dori. I took a number of photos on the way, but this one which was the last one I took that day, just sums up the mood of a quiet summers morning in Kyoto. One thing you will notice if you come to Kyoto is that almost no shops open until 11am, which does make mornings rather quiet in the city. If you're staying in downtown Kyoto, a stroll along the Kamogawa is a good way to start a morning on a fine day, regardless of the season. Even if you're not staying in the city the Keihan Railway follows it's course on the east bank (albeit underground) from Shichijo station up to Demachiyanagi station (the terminus), so exit at those stations or any in between to see the river. Kawaramachi station on the Hankyu Railway and Sanjokeihan station on the Kyoto Subway's Tozai line are also close to the river. At night in pleasant weather the riverside becomes more lively as many young people congregate on the west bank between Shijo Dori and Sanjo Dori, sometimes there are even buskers performing. Perhaps I will blog a bit more about that later. This photo was captured with a Nikon D700 camera and an AF 50f/1.8 lens with a circular polarising filter. In iPhoto I cropped the image, increased the contrast and warmed white balance slightly. 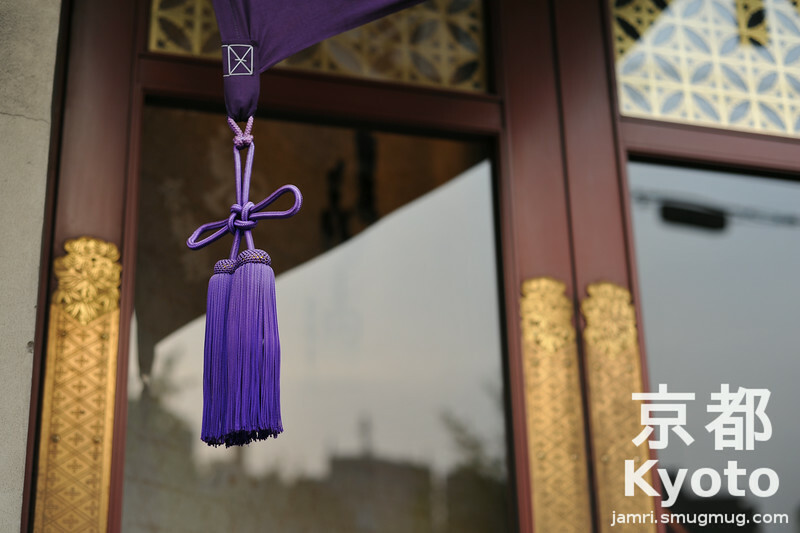 This purple cord was at the bottom of a curtain which was placed in front of the side door to the Minami-za Kabuki Theatre in Kyoto. The Minami-za Kabuki Theatre was originally founded in 1610, the current building dates from 1929, but it was built in the traditional style and is registered as a Japanese Tangible Cultural Property. Kabuki is the most popular traditional Japanese Theatre form, but one which has a rather checkered past. These days the official Kabuki troupes are all male groups, with male actors performing both male and female roles, however originally Kabuki troupes were all female. Kabuki actors wear elaborate costumes and a white makeup base often with coloured lines painted on it to emphasise the emotions or represent non-human characters. Kabuki theatres also have stages with trapdoors (to allow quick entrance of actors or props) and sections of the stage which revolve. The Minami-za Kabuki Theatre is in Gion, Kyoto on the corner of Kawabata Dori and Shijo Dori, pretty much right on top of the Keihan Railway's Gion-Shijo station. The Hankyu Railway's Kawaramachi station is only about 4 minutes walk further to the west. The only times in the year that you can watch Kabuki at Minami-za are during two 3 week periods: one in Spring and one in Autumn. At other times of the year there are different kinds of plays or sometimes the theatre is converted into a temporary Kabuki Museum. This photo was captured with a Nikon D700 and an AF 50f/1.8 lens. No post processing has been done on this image. Even for those of us who are long term residents of Kyoto, it's rare we ever see a real Maiko (apprentice Geisha) or Geiko (full-fledged Geisha) in the streets of Kyoto. Yes, there are some special times of the year when it's possible to see them at certain public events like the two Hanatouro and certain Shinto holy days. If you ever do see one on the streets, they are likely in a hurry and they are not going to stop for you to photograph them! However there are a number of fake Geisha in Kyoto, the easiest way to know they are fake is that they can't walk very gracefully in "Geta" or "Okobo" (the traditional wooden shoes Geisha wear) or they are wearing a different type of footwear (most likely "Zōri"). Sometimes the fakes will even pose for/with you for a photo. There are two common types of fakes: firstly tourist who pay money to get dressed up as Geisha and have their photos taken at famous spots in Kyoto; secondly actors paid to dress up as Geisha for tourism promotional purposes. 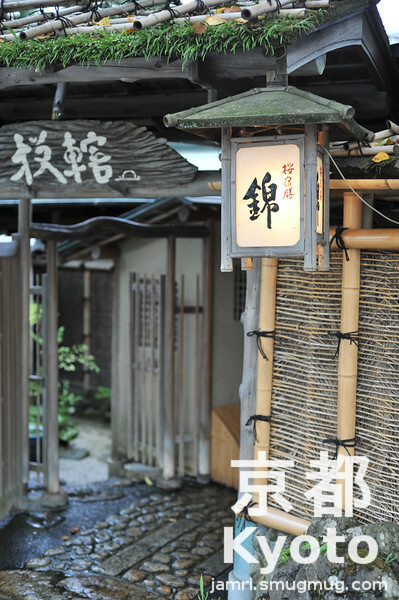 The photo above is of a Geisha Tea House (called "Ochaya" in Japanese), and it's where real Geisha entertain clients. The light with three back characters and a white background is the name of this Ochaya. The names of each of the Geisha that entertain in this place are on small wooden "business cards" on each side of the light. This Ochaya is in the Gion Kobu Geisha district on Hanamikoji Dori. Ochaya are very exclusive establishments and are not normally open to the general public. Hanamikoji Dori is in the Gion district of Kyoto. It crosses over Shijo Dori about 3 blocks up from the Kamogawa (Kamo river). The traditional neighbourhood with this and many other Ochaya is on the south side of Hanamikoji Dori. The nearest train station is Gion-Shijo on the Keihan Railway. At little bit further away, is Kawaramachi station on the Hankyu Railway. This this photo was captured in with a Nikon D700 and an AF 50f/1.8 lens. I made the following adjustments to the image in iPhoto: firstly it was rotated 1 degree to remove a slight tilt; secondly I brightened the shadow areas; thirdly I increased the definition; finally I adjusted the white balance to make the image warmer. 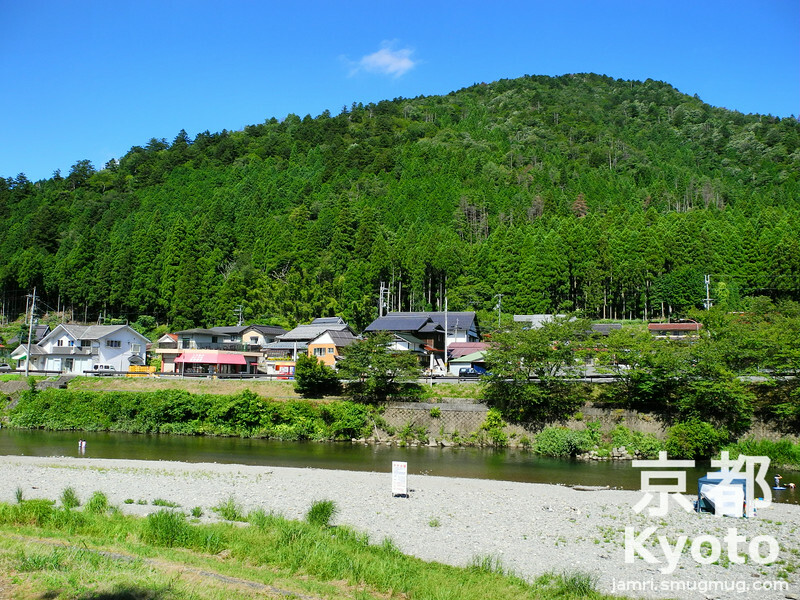 In the previous BLOG entry I mentioned about swimming in the clean waters of the Yura river at a place about 2km to the East of Miyama Kayabuki no Sato. Today's photo is from that swimming spot. I think it's the best swimming spot in Kyoto. The waters are very clean and there's quite a nice area on the South bank of the river where you can put your gear, pitch a tent or have a BBQ. This place is not too far up stream from a spot where there's a bit of a dam, meaning that the currents are not usually very strong. However remember it is a river, so if there are heavy rains upstream it may become unsafe, always check weather reports first. It's also wise to swim with a lifejacket on, most people swimming in this spot do so. The downside with this spot is that there are no change rooms. There is one Japanese style toilet cubical, but it seems a bit scary to change in there! Most people either use their cars, a small tent, or go behind the bridge to change. Another option is to walk about 500 meters up the street to an onsen (hot spring) and have a wash there after swimming (it costs about 500yen per person). See the previous BLOG entry for the various transport options for getting to the Miyama area. If you're coming by bus, this place is two stops from the Kayabuki no Sato stop. The actual bus stop is at the onsen where you'll need to wait for the return bus, but the drivers will drop you off at the bridge right above this spot if you ask them (some Japanese language skills required or a note written in Japanese to show the driver). Remember this place is very pristine, so please leave it the way you find it. Take away all your "Gomi" (trash/garbage/rubbish) in a bag, don't leave any there! Extinguish completely any fires you may have made. Let's take care of this pristine environment. This photo was taken with a Nikon Coolpix P7100 camera. No post processing has been done on this image. 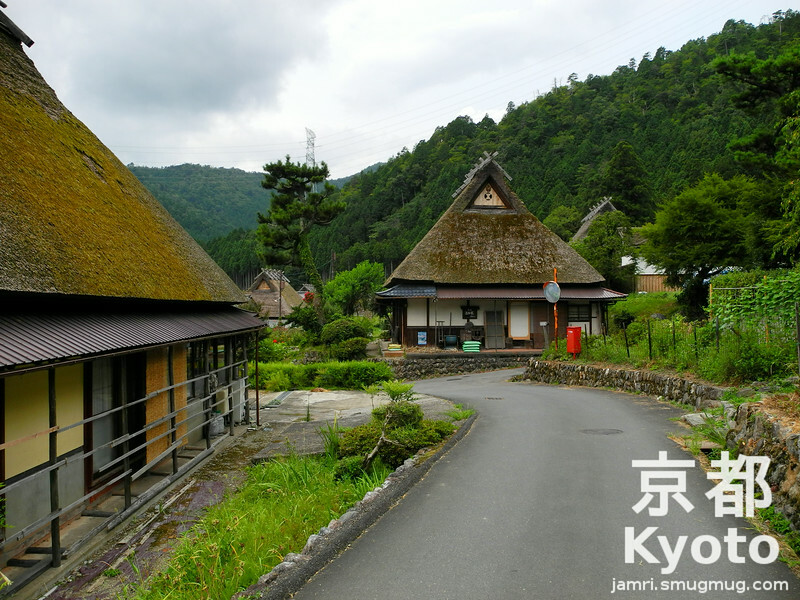 Miyama Kayabuki no Sato (Miyama Thatched Roof Village) is one place in Kyoto prefecture where you can really get away from it all, especially if you go there on a week day. Compared to other thatched roof villages in Japan, it seems to have so few tourist visiting it. Maybe it's because most of the buildings in this village are actually people's residences and there are very few used as cafes, restaurants, guest houses, museums and the like. In the whole of the Miyama-cho (Miyama town) area which is now actually part of Nantan-shi (Nantan city), so I don't think it's officially called Miyama-cho any more, there are some 250 thatched roof houses. However Miyama Kayabuki no Sato is a concentration of about 50 of these houses in an 18 hectare (approx. 44.5 acres) area in the North of the old Miyama town. I've had the chance to visit the Miyama area 5 times now, since I moved to Kyoto in 2008, although only twice have I walked in the village. The other three times I went to some other houses in the area and swam in the clean waters of the Yura river at a spot about 2km to the East of the village. I've only gone there during the summer months June-August, and it's a great way to escape the summer heat, as the temperatures and humidity are a bit lower than in Kyoto city. The photos I've seen of the other seasons look very beautiful. Spring with the cherry blossoms, autumn with the colour change, and winter with quite a lot of snow compared to what we get in Kyoto city and the suburbs. There are also two fire drill days when they test the village's fire fighting equipment one on May 20th and the other on the first Sunday in December, which from the photos and videos I've seen of it on the internet looks quite spectacular. Finally there is a snow festival in February. I think the main charm of the village and the whole Miyama area is the fact that there aren't too many touristy shops and restaurants, which I guess keeps the crowds away. On the south side of the main road about 3mins walk from the village there is a car park, only local traffic is allowed in the village. At each end of the car park there are places to eat, I've eaten lunch at the place at the East end of the car park twice and it's very good. For ice creams (locally made) I recommend the place at the West end of the carpark. There are two cafes in the village serving drinks and snacks, not meals. At least one house is a kind of B&B, so it's possible to stay overnight in the village. There's also a museum and a bakery, both of which were closed on the two times I visited. The best way to get to the Miyama area is by private transport, however if you don't mind spending a couple hours to get there from Kyoto city it's possible to use train and bus. During festival times and the hight of cherry blossoms and autumn colours there are some coach buses going there directly from Kyoto station and from some other urban centres around Kyoto. The times I've used the train and bus, I've caught the JR Sagano-Sanin line from Kyoto station to Hiyoshi (note at this station there are no IC card readers, so if you're not someone who's travelling in Japan with a Japan Rail Pass you'll have to buy cash tickets). From Hiyoshi, it's either one or two buses (depending on the time of day) just tell the driver you're going to "Kita-sato" and they'll let you know where you have to change buses if you need to. There are more buses on weekends than weekdays, during the week there's only about one bus every two hours or so! It may be possible to take a bus from Wachi station since it's much closer to Miyama, but I've never heard anyone here mention it. There nearest station with car rentals is Sonobe which is even further from Miyama than Hiyoshi, but has more frequent trains from Kyoto. The road from Sonobe to Miyama (route 19) is pretty good, so it might be the way to go if you don't want to rely on bus schedules. If you're driving from Kyoto or Osaka there's an exit on the new Kyoto North Expressway at Sonobe. If you don't want to use an expressway route 162 is the way to get there from Kyoto city. Fushimi-Momoyama-jo (aka Fushimi-Momoyama Castle, Fushimi Castle, Momoyama Castle) is one former famous sight in Kyoto that has disappeared off the tourist radar for a good few years now. Although the interior of the castle has been closed to the public since 2003, the building still remains, but it has been pretty much left to the elements. It is still possible to wander around the castle grounds surrounding the central building, the public toilets are still in operation and the vending machines in the grounds are stocked with drinks. I first noticed this castle when I visited Kyoto as a tourist in 2007, I saw it from the Kyoto tower and said to my wife "that looks like a cool castle why don't we go there?" However when we looked at our travel guide book (either the Lonely Planet or the Rough Guide), it said it was not worth seeing, it's better to catch the Shinkansen to see either Himeji Castle or Hikone Castle which are both originals. So I didn't visit it until after I moved to Kyoto. Actually I began to get interested again in visiting it when we could see it in the distance from a room we hired to hold English classes in, but it was not until the Summer Holidays of 2011 that I finally got the opportunity to go and look at it. The nearest train stations to the castle are the Keihan Railway's Tanbabashi Station and the Kintetsu Railway's Kintensutanbabashi Station. These stations are right next to each other, the castle is about 500m due east of these stations. If you're heading there from downtown Kyoto use the Keihan Railway. 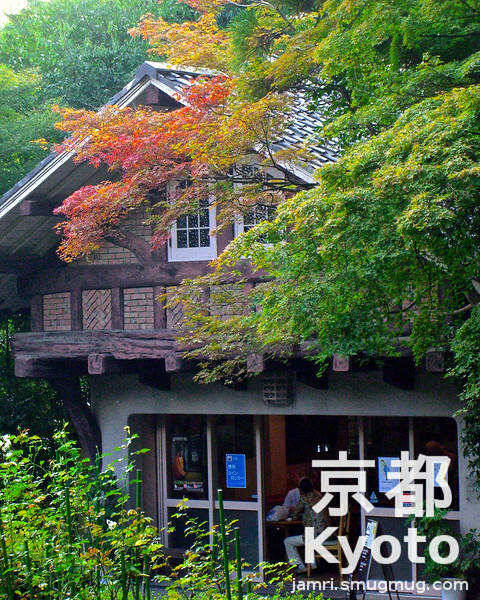 If you're heading there from the Kyoto Station area or Fushimi Inari Shrine use the Kintensu Railway. Both of these railways are private railways, so you can't use a Japan Rail Pass on them, but the fare from Kyoto is only about a couple of hundred yen. Although you can see the castle from a distance, it's not so easy to see it up close, because the area near it is either built up or forested. There are also no signs to mark the way. If you have a smart phone, use your favourite mapping app! The best way if you arrive at the Keihan station is to head to the Kintensu station and then take the east exit. At the road just outside the Kintensu station head south until you come to a junction then turn left, follow the road crossing over a pedestrian overpass and keep going. You'll pass a high school on your right, keep going and follow the left course of the road when it forks. When the road turns back 90 degrees to the right you're almost at the castle. The castle is at the end of the road. This this photo was captured in with a Nikon D700 and an AF 35f/2 lens. Compared to the original image from the camera, in iPhoto I've increased the contrast and definition, toned down the highlights, and warmed the image sightly. Well, we are well into August already, but as I explained in the previous BLOG post, I've had about two weeks break from blogging due to a trip to Australia and the aftermath. 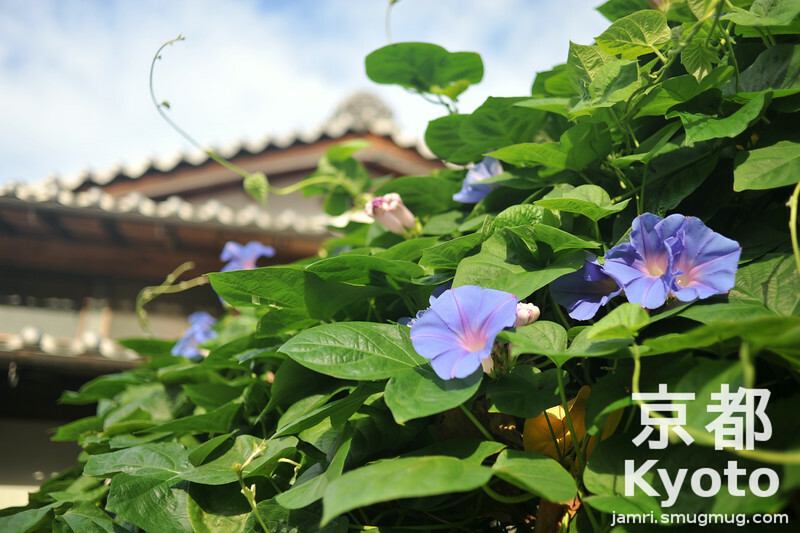 If you are in Kyoto (and many other places in Japan) in August you'll most probably come across morning glory flowers (called "asagao" in Japanese, lit. "Morning Face"). The may be grown in a bush (like the photo above), they can be used decoratively, grown as green curtains, or simply growing as wild flowers or weeds. This photo was taken in a residential area and these were growing in front of a traditional and rather large Japanese house. This house is located near the new Hankyu Kitayama-Tenmangu Station in Nagaokakyo city. However at the time I took the photo that station didn't exist. Here's a tip if you're planning on moving to Kyoto. The houses in Nagaokakyo city (about 15km from downtown Kyoto) are generally bigger than what you'll find in downtown Kyoto as the land is cheaper in Nagaokakyo. You might only pay 1/3 or 1/4 of the rent compared to living in the more central wards of Kyoto. Plus Nagaokakyo city has famous temple and shrine and it's also quite close to a number of others. There's also good railway access to downtown Kyoto and downtown Osaka, so it's a great place to commute from. Another place which is even cheaper than Nagaokakyo city is the outer lying Fushimi ward of Kyoto city, it also has a number of interesting sites and good rail access, but the downside is the number of factories in Fushimi. Closer to the downtown a cheaper option is to live in the Kita ward just to the north of the city. 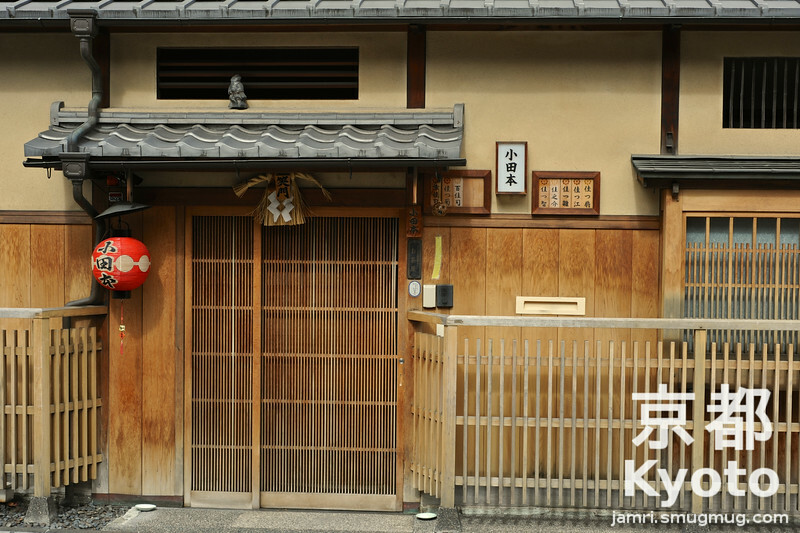 There are many famous Shrines, Temples and Traditional neighbourhoods in the Kita ward. The downside with Kita is the lack of trains or subway lines going there, you have to rely on buses which are not so reliable as trains. Normally this BLOG is focused on helping tourist make the most out of their visit to Kyoto, but having been asked about moving to Japan by a few people, I thought I'd share a bit about long term accommodation today. Actually unlike in my home country Australia where there's not much difference in price between the expensive and cheaper rentals these days due to housing shortages. In Japan prices change drastically between centre of the city and the suburbs. And then there's another big drop in rent prices if you live in the countryside. Many countryside places especially in Honshu still have good rail links to the cities. Country towns in Japan often have a lot more in terms of shops, restaurants, hospitals, etc than what you might find in a country town in Australia! There are also very few crime hotspots in Japan to worry about, apart from some neighbourhoods in the south of Osaka city! This this photo was captured in with a Nikon D700 and an AF 35f/2 lens. This the jpeg file straight from the camera, no post processing has been done on this image. This the last photo that I'm posting from the Gion Matsuri to this blog for now. Maybe I'll do another feature on it next July, if I'm still going with this BLOG. My wife and I recently made a short trip to Australia and then had a busy week catching up with work after that, so that's why I haven't posted any BLOGs for a while. I know it's August now, but I wanted to finish off the "July" themed photos with this one, before moving on the "August" themed photos. These guys were taking a break from carrying one of the smaller floats in the Gion Matsuri. I think this float is one of the smaller "yama" floats, but it seems to be a bit small even for one of those, so I'm not sure. There are a number of other objects including Mikoshi (portable Shinto Shrines) that are carried during the parade. It must be incredibly hard work pushing, pulling, or carrying the floats and Mikoshi during the parade in the summer's heat. Fortunately there are a number of times to rest, when they allow people to cross the roads in front of the parade. I snapped this photo while these four young guys where taking a break as they waited for the crowds to cross the road in front of them. This this photo was captured in with a Nikon D700 and an AF-S VR Zoom-Nikkor 70-300f/4.5-5.6G IF-ED lens. This the jpeg file straight from the camera, no post processing has been done on this image. On the three nights prior to each of the float parades, some of the streets of downtown Kyoto are closed to vehicle traffic and the floats are lit up with lanterns. Around the streets you'll find all kinds of temporary stalls selling food and other items. 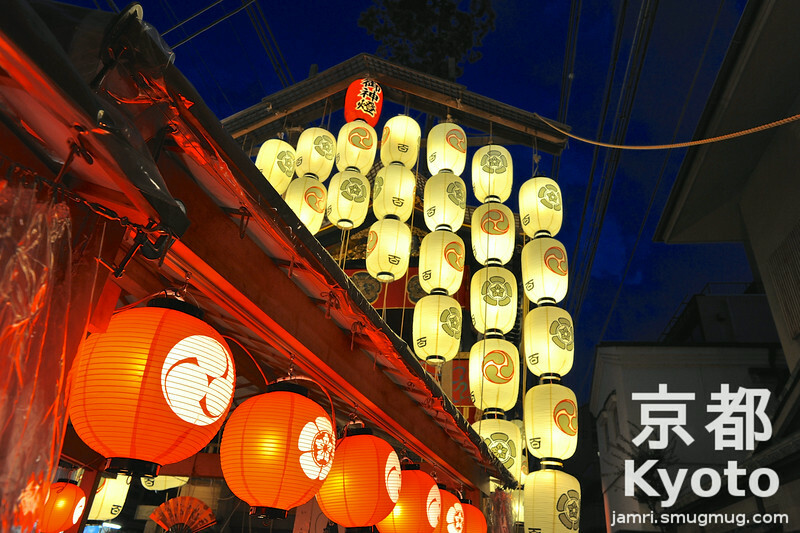 The streets are crowded and many people wear yukata (summer kimono), it's an exciting time to be in Kyoto city. The floats are lit up on the three nights prior to each parade. That is the evenings of July 14th, 15th, and 16th prior to the first parade on July 17th and the evenings of July 21st, 22nd, and 23rd prior to the second parade on July 24th. The night before each parade is called "Yoiyama", 2 nights before is called "Yoiyoiyama", and 3 nights before is called "Yoiyoiyoiyama". It is possible on these evenings to actually go and see inside the floats, however getting a ticket to let you in is not an easy task. 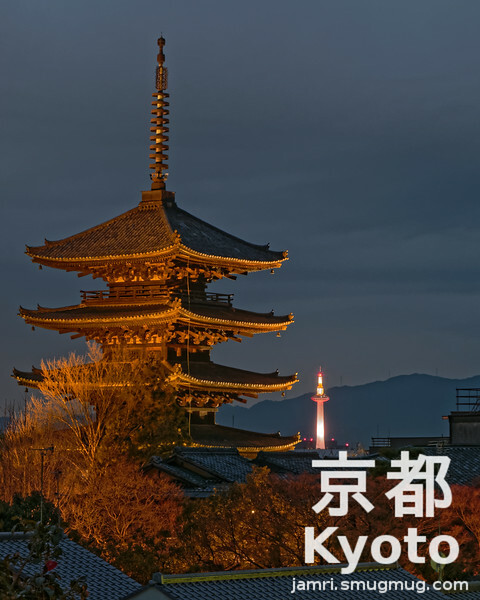 If you have a friend who's a Kyoto local they may be able to help you out. Otherwise just enjoy the close up view of the lit up floats from the ground. Most of the floats are located on Shijo-dori or on side streets that run off Shijo-dori between Horikawa-dori (to the east) and Kawaramachi-dori (to the west). The best train stations to disembark from to see the light ups are Karasuma on the Hankyu Railway and Shijo-Karasuma on the subway Karasuma line. If you're using the Keihan Railway, then Gion-Shijo is the nearest stop to the light ups. This photo was taken with a Nikon D700 camera and an AF Nikkor 24f/2.8D lens. Compared to the original image from the camera, in iPhoto I increased the definition, darkened the highlights and brightened the shadow areas.